Added bonus language as option for the bonus proficiencies to all races. (Now need to add that on Settings sites). Added an Ability Score bonus to Jungle Halflings - I felt they could still have this given the amount of drawbacks they have vs other subraces. This page does not include societal and cultural descriptions. They will be included on the individual settings sites, as they describe how each race fits into that particular world. This page is for rules only. Use it as a repository to cut and paste races for each setting. We have also included all races available in the published 5E D&D books for easy reference and where to find them. You will need to consult those sources for the stats in playing that particular race. We try to use the races as written in the various books, but where features overlap with our house rules, the changes are noted here. The most common change here will be how weapon proficiencies affect Weapon Groups if you use them, but also abilities that might mention initiative or inspiration. You still gain a bonus proficiency for each minor drawback assigned to your race, but you must select it from the proficiencies listed here. If your race starts with a major drawback, then you must select a racial feat as compensation (you cannot select any feat). If a race starts with a minor drawback, you still get the full benefits of a major if you upgrade to the major drawback. These drawbacks can be 'bought off' with a GM's permission, just as any other drawback can be, as detailed on the Drawbacks Page. We not only have modified races from the core books, but a number of conversions from various editions of D&D and even some from other games. Furthermore, we have included several of our own creations (mostly from our Kage Campaign Setting). Game Statistics & Lore. 5e D&D Elemental Evil Player's Companion. Further Lore & Roleplaying Ideas. This subrace has been a staple of D&D for many editions. They have ties to the Elemental Plane of Air and are detailed in Wizards of the Coast's Elemental Evil Player's Guide. In older editions of D&D their hands/claws were part of their wings. In 5E they have a separate pair of arms, making them the same as harkrinns in appearance. The two may have been the same subrace, with harkrinns having lost their touch with the Elemental Plane of Air. Talons. If using our house rules, this grants proficiency in the Natural Weapons group proficiency. Wings. For an aarakocra's wings to be able to function, they must have a number of feet equal to their height free on both sides of them. If their wings can be used, an aarakocra gains advantage on Strength (Athletics) checks made to jump, can ignore falling damage, or glide forward 2 feet for every 1 foot descended. You have disadvantage on Strength (Athletic) checks made to swim. Brittle Bones (Major). To enable flight, birdfolk have hollow or light bones. Dullard (Minor) OR Frail (Minor) OR Weak (Minor). There is not a real standard weakness across all aarakocra, though each of these is common enough. Aversion (Minor). Applies when interacting with creatures of the earth (typically those native to the Elemental Plane of Earth and/or speak Terran). Fear of Confinement (Racial Minor). After spending 1 hour under the earth you must make a Wisdom DC 12 saving throw. On a success, you cope until your next long rest. On a failure, you lose your nerve and make all checks and attacks with disadvantage until you complete a long rest. This save must be repeated following every long rest if you remain below ground. Outsider (Minor). 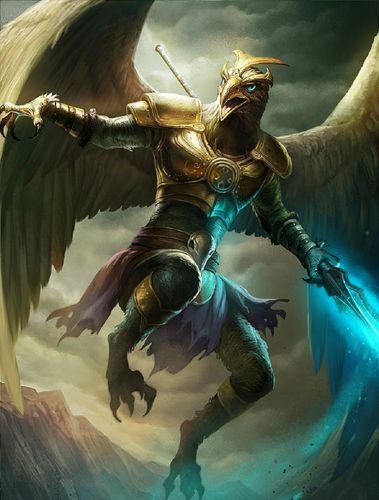 Aarakocra are literally outsiders, being native to the Plane of Elemental Air. They think very differently to ground-dwelling humanoids and feel nothing but pity for those unable to fly. Bonus Proficiencies. For each minor drawback assigned to a protector aasimar, you select one of the following: Nature, Perception, Survival, or Spears (Simple) or one relevant language. Game Statistics & Lore. 5e D&D Volo's Guide to Monsters chapter 2. Further Lore & Roleplaying Ideas. 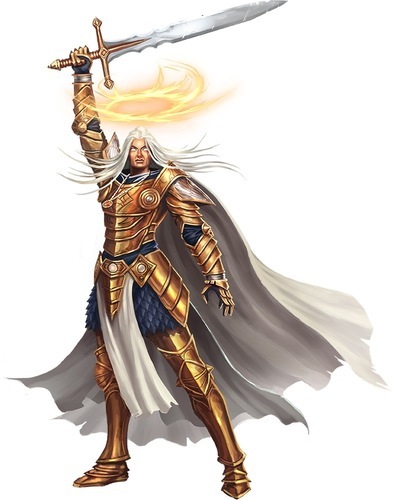 Aasimar are celestial plane-touched, and as a result are often champions of good. 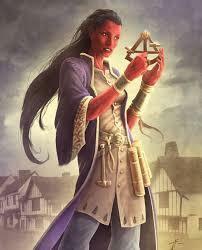 They were introduced to the Planescape Setting as the good version of the tiefling. They can be found in the 3E Races of Destiny. Not all aasimar need to have humans as their mortal side either. It would be easy enough, with the GM's permission to combine this race with the core features of another race. The main thing to watch for is ability score bonuses - there still should only be increases to two of them. Further Lore & Roleplaying Ideas. Honourable (Minor). Deceit is not a trait you possess. Loyal (Minor). You protect your allies and all that is good. You do not leave those people behind. Bonus Proficiencies. For each minor drawback assigned to a protector aasimar, you select one of the following: Insight, Perception, Persuasion, Hammers & Maces (Simple + Martial), Long Blades (Simple + Martial) or one relevant language. Haughty (Minor) OR Insensitive (Minor). You ideals can be inflexible in the eyes of others. You may be too focused on destroying evil to see what others really want. Bonus Proficiencies. For each minor drawback assigned to a scourge aasimar, you select one of the following: Endurance, Intimidation, Hammers & Maces (Simple + Martial), Long Blades (Simple + Martial) or one relevant language. Unstable (Minor) OR Insensitive (Minor). You ideals can be inflexible in the eyes of others. You may be too focused on destroying evil to see what others really want. Bonus Proficiencies. For each minor drawback assigned to a fallen aasimar, you select one of the following: Endurance, Intimidation, Hammers & Maces (Simple + Martial), Long Blades (Simple + Martial) or one relevant language. Game Statistics & Lore. 5e D&D - House (see below). Further Lore & Roleplaying Ideas. These are an aquatic race from the Star Wars setting. You can see the Alien Anthology from Star Wars d20 and they are also written up in the back of the Saga Edition core rulebook. 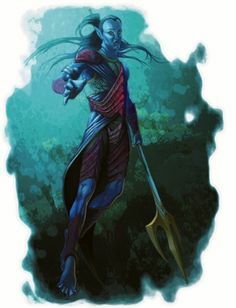 I am a fan of adapting races/species from other settings and I have used the aqualish before, such as in the Summer Isles Setting. There are two minis that can easily be used in a fantasy campaign (a roguish-looking guys with a dagger and a 'wizardy' one with a staff), and I made another by removing a blaster and adding a sword. Amphibious. Aqualish can breathe air and water. Swim. You also have a swim speed of 30ft. The three subraces of aqualish do not like each other. Improved Swim Speed. Your swim speed increases to 50ft. Aquala have fins instead of hands. Belligerent (Major). It is customary and expected social behaviour for an Aqualish to be pushy and forceful upon first meeting others. Outsider (Minor). Applies to all non-aquatic encounters. Fins (Major). This is the same as the All-Thumbs flaw. Aquala do not have hands and find it difficult manipulating most items. Bonus Proficiencies For every minor drawback assigned to an aquala, you choose one of the following. Endurance, Insight, Intimidation, or Perception or one relevant language. Bonus Racial Feat. For each major drawback assigned to an aqualish character, you select one aqualish racial feat. 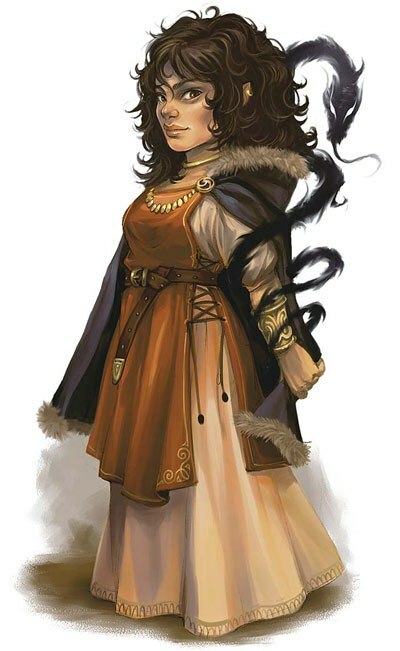 In place of a racial feat, an aquala character may select the Tough feat from the 5E D&D Player's Handbook chapter???. Swamp Born. You ignore movement penalties for swamp and marsh difficult terrain. Cocky (Minor). The Aquala despise the Quara for giving all Aqualish a reputation as thugs. As a Quara, you have a very forceful personality. Bonus Proficiencies For every minor drawback assigned to a quara character, you choose one of the following. Endurance, Insight, Intimidation, or Perception or one relevant language. Bonus Racial Feat. For each major drawback assigned to a quara character, you select one aqualish racial feat. In place of a racial feat, a quara character may select the Tough feat from the 5E D&D Player's Handbook chapter???. Exceptional Vision. You have advantage on Wisdom (Perception) checks that involve sight. You have 4 highly-adapted eyes with separate eyelids for light an dark conditions. Soft-Skin (Major). The Ualaq's aquatic skin has become more amphibian-like, and without the pressure of the deeps has become a vulnerability. Bonus Proficiencies For every minor drawback assigned to an ualaq character, you choose one of the following. Athletics, Endurance, Insight, Intimidation, or Perception or one relevant language. Bonus Racial Feat. For each major drawback assigned to an ualaq character, you select one aqualish racial feat. Further Lore & Roleplaying Ideas. There is a lot of lore on bugnears in chapter 1 of Volo's Guide to Monsters too. Anti-Social (Minor) OR Dullard (Minor). Bugbears are certainly not known for their pleasantries and can often come across as stupid, despite their cunning. * Heavy Sleeper (Minor). Bugbears are well known for their short bursts of activity and then prolonged rests. Outsider (Minor). Outside goblinoid societies, bugbears are rarely welcomed. In fact, they are often the subject of lurid tales and known as bogey-men. * Threatening (Minor). Bugbears typically bully others. Bonus Proficiencies. For each minor drawback assigned to a bugbear, you select one of the following: Athletics, Intimidation, Perception, Brawling Weapons (Simple + Martial), or Clubs & Staffs (Simple + Martial) or one relevant language. Game Statistics & Lore. 5e D&D House (see below). Further Lore & Roleplaying Ideas. The canisarans are a communal/pack culture that live very close to nature. In our setting Kage, we had many initial subraces, below I have divided these according to their general homeland terrain. (See the document outlining canisaran society attached to Files below. It was written for 3E, but has all the cultural information). 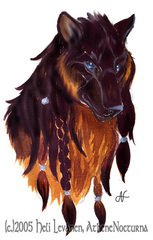 Canisarans were my first fully developed race and were one of the main starters for the world of Kage. My love of Native American culture manifested in this race (and ideas were sparked by the accompanying picture by Parkinson). Mask of the Wild. You can attempt to hide even when you are only lightly obscured by foliage, heavy rain, falling snow, mist and other natural phenomena. Desert Born. You ignore movement penalties for rocky or sandy difficult terrain. You're naturally adapted to extreme heat, as described in chapter 5 of the Dungeon Master's Guide. Languages. Canisaran and one other of your choice selected from the races that share your badlands home. Anti-Social (Minor) OR Dullard (Minor). Many canisarans simply have trouble relating to others and do not care for formal learning or value knowledge that has nothing to do with survival or of immediate benefit. Armor Avoidance (Minor). 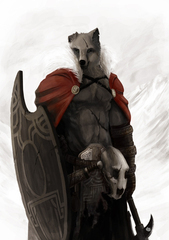 Armor is uncomfortable and typically not worn by canisarans. Aversion (Minor). Applies to feline beasts and when interacting with therans, wemics and other intelligent catfolk. Illiterate (Minor). Canisarans do not typically have a written tradition. Outsider (Minor). Canisarans have trouble relating to anyone that has not grown up in the wild. Primitive (Minor). Canisarans use what is available in their environment to craft their equipment. Bonus Proficiencies For every minor drawback assigned to a badlands canisaran, you select on of the following proficiencies: Acrobatics, Animal handling, Athletics, Endurance, Intimidation, Stealth, Survival, or Bows (Simple) or one relevant language. Further Lore & Roleplaying Ideas. 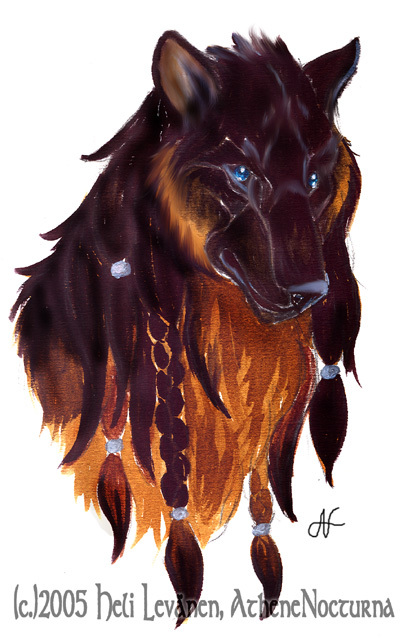 Frontier canisarans are more likely to come into contact with civilised races and often associate with wood elves. Forest Born. You ignore movement penalties for forest difficult terrain. Bonus Proficiencies For every minor drawback assigned to a frontier canisaran, you select on of the following proficiencies: Animal handling, Athletics, Stealth, Survival, Axes & Picks (Simple), Bows (Simple), Brawling (Simple), Clubs & Staffs (Simple), Spears (Simple) or one relevant language. Languages. Canisaran and one other of your choice selected from the races that share your jungle home. Bonus Proficiencies For every minor drawback assigned to a jungle canisaran, you select on of the following proficiencies: Animal handling, Athletics, Endurance, Intimidation, Medicine, Religion, Survival, Blowguns (Simple), Bows (Simple), Brawling (Simple), Clubs & Staffs (Simple), Spears (Simple), or Vehicles (oared) or one relevant language. Frost Born. You ignore movement penalties for snow and icy difficult terrain. You're also naturally adapted to cold climes, as described in chapter 5 of the Dungeon Master's Guide. Languages. Canisaran and one other of your choice selected from the races that share your frigid home. Bonus Proficiencies For every minor drawback assigned to a northern canisaran, you select on of the following proficiencies: Acrobatics, Animal handling, Athletics, Endurance, Survival, Bows (Simple), Spears (Simple), or Vehicles (oared) or one relevant language. Beast Rider. You start the game with the Beast Rider racial feat (or the features of that feat if you do not use them in your game). Bonus Proficiencies For every minor drawback assigned to a northern canisaran, you select on of the following proficiencies: Acrobatics, Animal handling, Athletics, Endurance, Intimidation, Stealth, Survival, Axes & Picks (Simple), Bows (Simple), Spears (Simple) or one relevant language. Further Lore & Roleplaying Ideas. This catfolk entry can be used to represent most small, agile cat anthropomorphs. 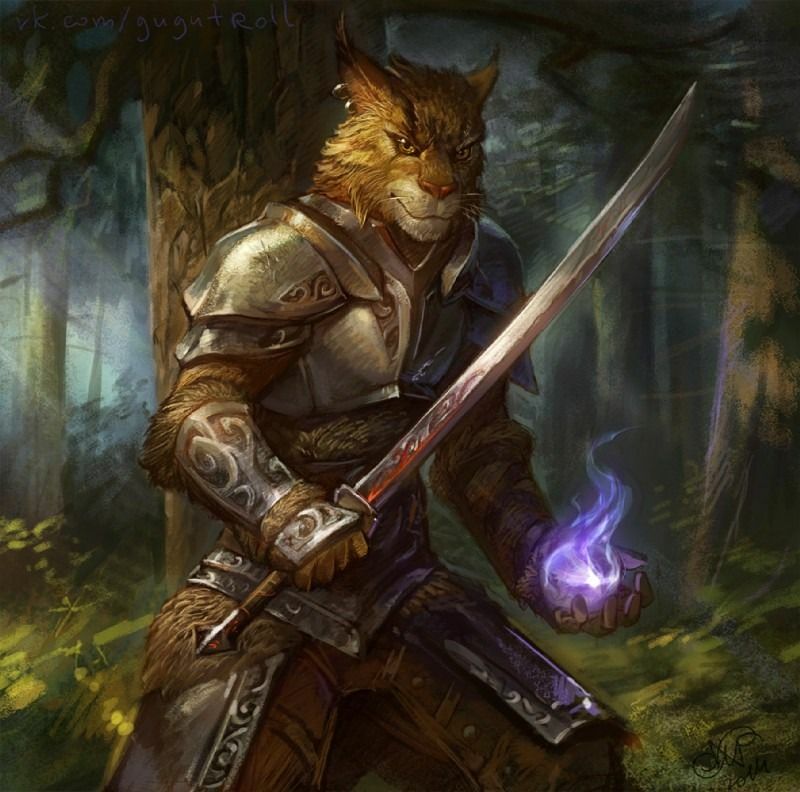 Rakasta are the typical dextrous catfolk from earlier editions of Dungeons & Dragons or the rakashans from Savage Worlds. 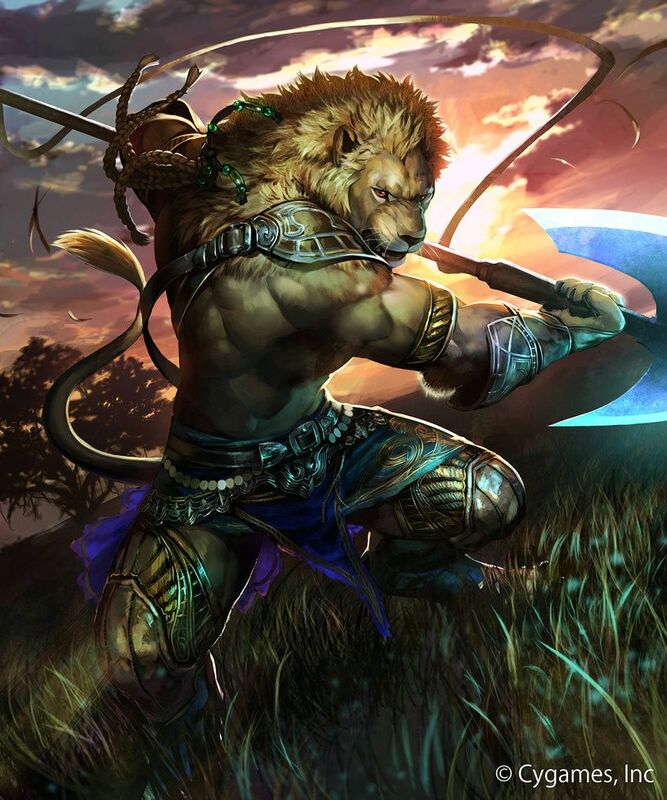 Rakasta was a common name used for this type of catfolk, I believe from Mystara originally. In our Kage setting they are known as khitsari. 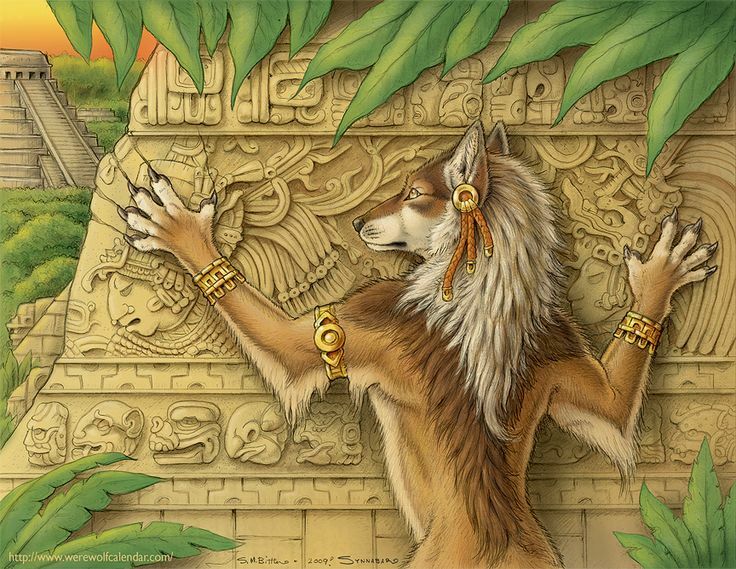 Keep in mind there are several entries here for a variety of catfolk that may meet your specific need: Litorians (proud lionfolk); Tigrans (savage tigerfolk); Therans (leopard or jaguar folk); Tabaxi (smaller leopard, like clouded leopard folk that seek knowledge). 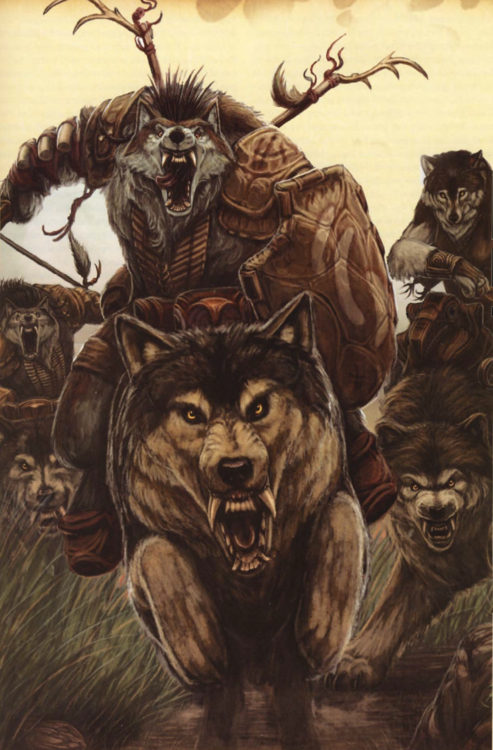 The entry below is based more upon 3E D&D catfolk as they appeared in Races of the Wild chapter 4. Darkvision. You can see in dim light within 60 feet of you as if it were bright light, and in darkness as if it were dim light. You can't discern colour in darkness, only shades of grey. Your eyes amplify like a cat's giving you superior vision in dark and dim conditions. Keen Senses. You have proficiency in the Perception skill. Catfolk have superior senses, including smell. Natural Climbers: You have advantage on all Climb checks. Catfolk have capable claws and an uncanny ability to climb. Natural Weapons: Catfolk arms end in retractable claws and they have sharp teeth, both of which can be used as natural weapons, dealing 1d4 slashing damage. (You are not proficient in the use of these weapons unless you take the Natural Weapons Group proficiency). Languages. Common and Elven (or another appropriate language for the catfolk's habitat. On Kage this would be Felisian).. Aversion (Minor). Applies to canine beasts and when interacting with canisarans, gnolls and other intelligent canine-folk. may not apply to all settings. Outsider (Minor). Catfolk have trouble relating to anyone that has not grown up in the wild. Primitive (Minor). Catfolk are nomads and rarely stay in one place long enough to mine and set up forges. Dullard (Minor) OR Weak (Minor). 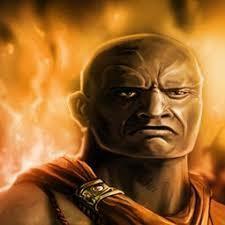 Many rakasta lack the mental agility of other races and they are slight of build. Illiterate (Minor). Catfolk do not typically have a written tradition. Bonus Proficiencies. For each minor drawback assigned to a catfolk character, you select one of the following: Acrobatics, Animal Handling, Stealth, Survival or Natural Weapons or one relevant language. Game Statistics & Lore. 5e D&D House, (see below). Original appearance and lore in 3E D&D compatible Monte Cook's Arcana Unearthed chapter 2, where they are just called giants. Further Lore & Roleplaying Ideas. This entry represents a very ritualistic race of giants that can change their mindset (represented here as a subrace) and in some cases, even perform magical ceremonies to increase their size. In the the Diamond Throne setting (in Monte Cook's Arcana Unearthed for 3E), these giants are known as Hu-Charad (which means 'stewards'). The listed mind sets are Wardance and Caretaker. Typically, the giants from civilised lands are in the Caretaker mindset, whilst those in the wilds would adopt the Wardance. Changes are usually generational, but an individual giant can perform a ritual to change their stance. In Kage, these giants have an important role in the land of Hazara-Thun and are known as fira. Ability Score Increase. Your Strength score increases by 2 and your Wisdom score increases by 1. Powerful Build. You count as one size larger when determining your carrying capacity and the weight you can push, drag or lift. You are also counted as one size larger to for opposed rolls where your bulk would be beneficial, such as resisting forced movement and being swallowed whole. Furthermore, when wielding a versatile weapon, you deal the damage listed for using two-handed. Ritual Mindset. A ceremonial giant must choose the mindset of Caretaker or Wardancer to begin the game. (These operate the same as subraces and are presented as such below). A giant is likely to stay in one mindset for life. However, if circumstances change significantly in a giant's life they can perform a day long ritual to change mindsets. When this occurs, replace one subrace's drawbacks (and bonus proficiencies or feats gained through drawbacks) with the other. Furthermore, changing into the Wardancer mindset adds one level of exhaustion that can be removed after a long rest. Although not technically subraces, a giant adopts one of these mindsets and only changes with a change in life circumstances. Protected Allies. As long as you are not restrained or unconscious, all allies within 5 feet of you gain +1 AC verses attacks that you are aware of. Your bulk tends to attract attacks and you use your size to protect those around you. Cautious (Minor) OR Loyal (Minor). Giants as caretakers consider themselves stewards and are very protective of those in their care and companions. This mindset typically makes them cautious and calm too. Lumbering (Minor). Your bulk means you are not as agile or flexible as other races. Bonus Proficiencies. For each minor drawback assigned to a caretaker giant, you select one of the following: Arcana, History, Insight, Medicine, Performance, Persuasion, or any artisan's tools or one relevant language. Giant Toughness. Your hit point maximum increases by 1, and it increases by 1 every time you gain a level. Belligerent (Minor) OR Outsider (Minor). Wardancer giants tend to be more aggressive, territorial and typically dwell in areas where they fight to survive. Bonus Proficiencies. 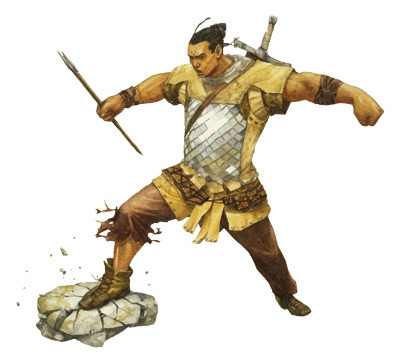 For each minor drawback assigned to a wardancer giant, you select one of the following: Athletics, Intimidate, or any weapon groups (Simple + Martial for all groups) or one relevant language. Further Lore & Roleplaying Ideas. Changelings were a player race from Eberron campaign setting. The 3rd edition description could be used, just as easily as the 4th Edition version from the Eberron Player's Guide. Although they are not as fully adaptable as doppelgangers, they could take their place in some worlds. Weak (Minor) OR Frail (Minor). Changelings' malleable form lacks strength and their build, despite appearances, is naturally slight. Bonus Proficiencies. For each minor drawback assigned to a changeling, you select one of the following: Deception, Insight, Intimidation, Investigation, Persuasion, Stealth, or Streetwise or one relevant language. Game Statistics & Lore. 5e D&D Player's Handbook chapter 2. Further Lore & Roleplaying Ideas. The information here represents the proud and honorable race of dragonborn from Dungeons & Dragons 4th & 5th editions. They also appear in 13th Age as Draconic/ Dragonspawn and as part of the Bashed & Borrowed house rules. Honorable (Minor). Dragonborn are noble and forthright. Bonus Proficiencies. For each minor drawback assigned to a dragonborn, you select one of the following: Athletics, History, Intimidation, Persuasion, Long Blades (Simple + Martial), Shields (Simple + Martial) or one relevant language. Further Lore & Roleplaying Ideas. Racial descriptions for typical dwarves can be found in many products. 5E D&D Mordenkainen's Tome of Foes has a massive amount of lore on the dwarves. Game Statistics & Lore. 5E D&D as the jade dwarf in the En5ider article Children of the Earth. Further Lore & Roleplaying Ideas. This subrace represents an aasimar-styled dwarf. In the Kage setting they are green-skinned and known as jade dwarves. Dwarven Combat Training. If using weapon groups, replace the weapon proficiencies listed with: Short Blades (Simple + Shortsword) and Long Blades (Simple). Honorable (Minor). Hill dwarves have a lot of racial pride to uphold. Loyal (Minor). 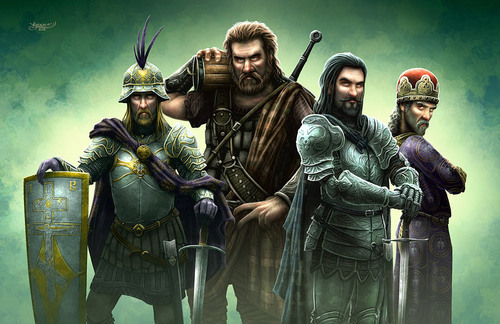 The bravery and steadfastness of these dwarves is legendary. Bonus Proficiencies. For each minor drawback assigned to a celestial dwarf, you select one of the following: Endurance, Crossbows (Simple + Martial), Shields (Simple + Martial), Siege Weapons (Simple + Martial), smith's tools, or mason's tools or one relevant language. (Art by Seraph777. Source unknown). Game Statistics & Lore. 5e D&D Mordenkainen's Tome of Foes chapter 3 and Sword Coast Adventurer's Guide chapter 3. Further Lore & Roleplaying Ideas. On Kage these dwarves are known as stone dwarves and make use of the non-magical option presented. 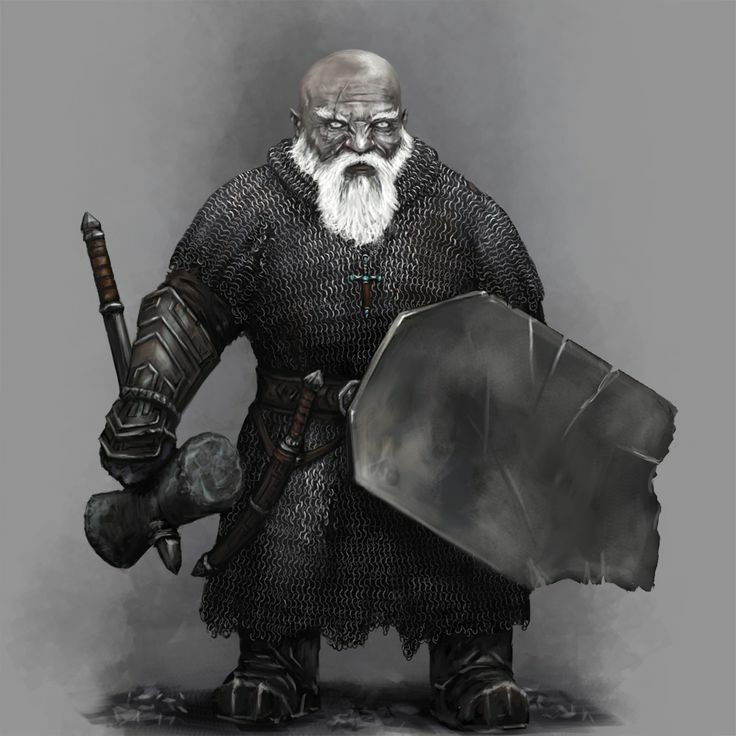 In the Forgotten Realms and other official D&D settings, these dwarves are known as duergar. 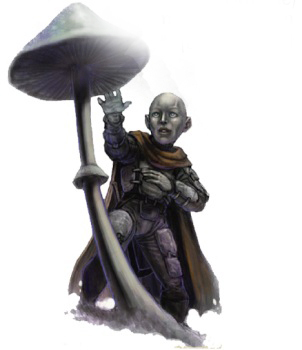 Duergar are known to possess magical or even psionic abilities - something they likely developed when enslaved by the mind flayers. Duergar Magic. This feature is not automatically granted to all deep dwarves. It has been moved to a racial feat. Outsider (Minor). Duergar are reclusive at best, but more likely hostile. Sunlight Sensitivity (Major). Your senses and skin have adapted to a life underground. Bonus Proficiencies. For each minor drawback assigned to a deep dwarf, you select one of the following: Endurance, Perception, Stealth, Shields (Simple + Martial), Spears (Simple), smith's tools, or mason's tools or one relevant language. Bonus Racial Feat. For the major drawback assigned to a deep dwarf, you select one dwarf racial feat. For typical D&D duergar this is the Duergar Magic racial feat. For some settings where deep dwarves were not enslaved by mind flayers and did not develop magical or psionic powers, you are free to choose any dwarf racial trait. Game Statistics & Lore. 5e D&D (House - see below). Further Lore & Roleplaying Ideas. These dwarves are based upon the ever-toiling dwarves of the 2E & 4E Dark Sun setting. These dwarves always have a focus. Something the be working towards that cannot be achieved in less that a week. If you play one of these dwarves think carefully about what your current focus is. See the source books for ideas. Bonus Proficiencies. 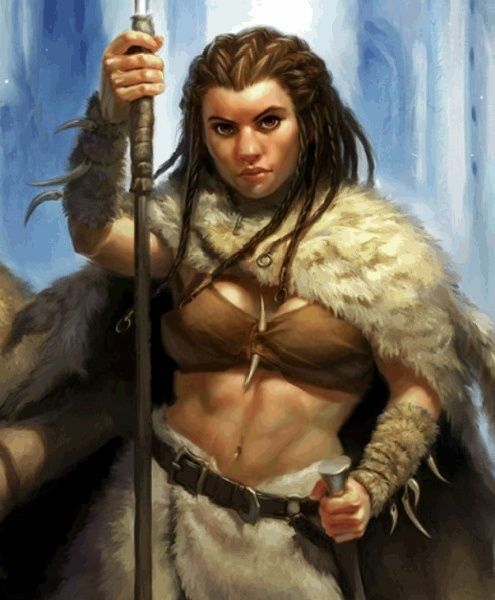 For each minor drawback assigned to a desert dwarf, you select one of the following: Athletics, Endurance, History, Nature, Survival, Brawling (Simple), Clubs & Staffs (Simple), Spears (Simple), or any one tool kit or vehicle group that is related to your focus or one relevant language. Game Statistics & Lore. House (see below). Cold Resilience. You have advantage on saving throws versus cold attacks and have resistance to cold damage. Dwarven Combat Training. Add warpick to the proficiencies granted. If using weapon groups, add this weapon to the Axes & Picks proficiencies. Frost Born. You're also naturally adapted to cold climes, as described in chapter 5 of the Dungeon Master's Guide. Also, when traveling through or leading others through terrain affected by snow or ice, your overland travel rate is not slowed. Furthermore, you have advantage on Dexterity saves to keep your footing due to icy ground (including that created by magic). Heat Weakness. You roll saving throws or ability checks to resist the effects of heat or fire damage with disadvantage. Honorable (Minor). Frost dwarves have a lot of racial pride to uphold. Bonus Proficiencies. 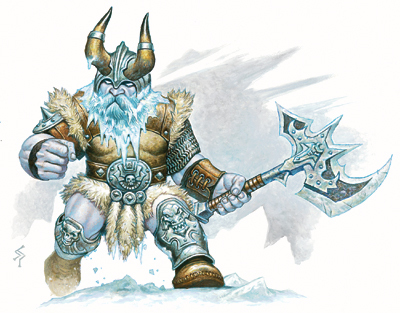 For each minor drawback assigned to a frost dwarf, you select one of the following: Endurance, Survival, Light armor, Medium armor (requires light armor first), Shields (Simple + Martial), smith's tools, ice-carver's tools, or mason's tools or one relevant language. Further Lore & Roleplaying Ideas. This is the most common subrace of dwarf. It is used to represent the earth dwarves of Kage. Landlubber (Minor). Many dwarves are not at home without the solidity of earth under their feet. (You can only benefit from this drawback if water travel is likely in your campaign). Bonus Proficiencies. For each minor drawback assigned to a hill dwarf, you select one of the following: Endurance, Crossbows (Simple + Martial), Siege Weapons (Simple + Martial), smith's tools, brewer's supplies, or mason's tools or one relevant language. Honorable (Minor). Mountain dwarves have a lot of racial pride to uphold. Bonus Proficiencies. For each minor drawback assigned to a mountain dwarf, you select one of the following: Endurance, History, Crossbows (Simple + Martial), Shields (Simple + Martial), Siege Weapons (Simple + Martial), smith's tools, brewer's supplies, or mason's tools or one relevant language. Further Lore & Roleplaying Ideas. Other appropriate names for these dwarves could be magma or obsidian dwarves. For African-styled settings these features could represent utuchekulu from the 3E D&D Nyambe: African Adventures by Atlas Games. Heat Born. You're naturally adapted to hot climes, as described in chapter 5 of the Dungeon Master's Guide. Furthermore, you have resistance against fire damage. Cold Weakness. You roll saving throws or ability checks to resist the effects of cold weather or cold damage with disadvantage. Haughty (Minor). Volcano dwarves not only have a lot of racial pride, they take personal pride to whole new levels, to the point of assuming leadership in groups of non-obsidian dwarves, even if not suited to the task. Illiterate (Minor). Individual shamans and priests may know runes, but the typical clan member does not. Outsider (Minor). Volcano dwarves are often violent, abrasive and their cannibalistic nature gets in the way of relations with other races. Primitive (Minor). Volcano dwarves do not work with metal, but favour stone, including, of course, obsidian. Bonus Proficiencies. For each minor drawback assigned to a volcano dwarf, you select one of the following: Athletics, Endurance, Survival, Spears (Simple + Martial), cooking utensils, herbalist kit, smith's tools or mason's tools or one relevant language. Game Statistics & Lore. As flint dwarf in En5ider article Children of the Earth. Further Lore & Roleplaying Ideas. Wild dwarves are typically primitive cave or hut dwellers. They don't build elaborate holds or work forges like other dwarves. On Kage these are known as flint dwarves. For Oriental-styled settings they would be appropriate for korobokuru (as presented in the 1E & 3E D&D Oriental Adventures books). Dullard (Minor). Wild dwarves are simply not as sophisticated or learned as other races. Illiterate (Minor). Wild dwarves are typically too concerned with survival and have lost the tradition of rune-writing. Individual shamans and priests may know runes, but the typical clan member does not. Outsider (Minor). Wild dwarves are often violent, primitive or both and have little to do with other races if they can help it. Primitive (Minor). Wild dwarves rely upon weapons and tools easily crafted from their environment. Bonus Proficiencies. For each minor drawback assigned to a wild dwarf, you select one of the following: Athletics, Endurance, Survival, Blowguns (Simple), Spears (Simple), cooking utensils, herbalist kit, trap making tools or mason's tools or one relevant language. Further Lore & Roleplaying Ideas. Racial descriptions for typical elves can be found in many products. 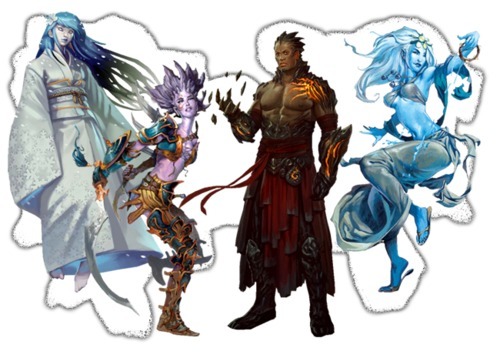 5E D&D Mordenkainen's Tome of Foes has a massive amount of lore on the elves. Further Lore & Roleplaying Ideas. Some settings, such as Kage have elves of the underdark that do not necessarily have set magical abilities. The drow are common to several D&D published settings, such as Forgotten Realms. The drow are dark elves with select magical powers. Drow Magic. This feature is not automatically granted to all dark elves. It has been moved to a racial feat. Drow Weapon Training. If using the weapon group proficiencies house rule, this feature grants proficiency with: Crossbows (Simple & hand crossbow) and Short Blades. Frail (Minor) OR Weak (Minor). Drow have slight builds. Outsider (Minor). 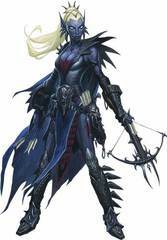 Drow are known to be scheming, cruel and outright evil, making other races reluctant to deal with them. Bonus Proficiencies. For each minor drawback assigned to a dark elf, you select one of the following: Arcana, Deception, Persuasion, Stealth, or poisoner's kit or one relevant language. Bonus Racial Feat. For the major drawback assigned to a dark elf, you select one elf racial feat. For typical D&D drow this is the Drow Magic racial feat. For some settings where dark elves do not have assigned magical powers, you are free to choose any dwarf racial trait. Further Lore & Roleplaying Ideas. 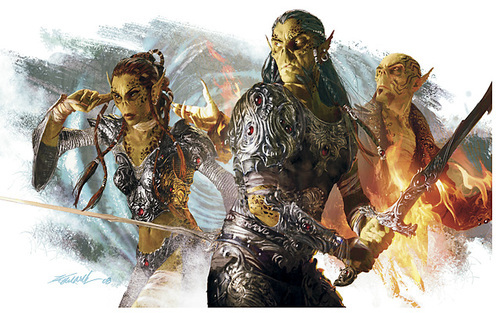 These leves are based upon the running elves of the 2E & 4E Dark Sun setting. Bonus Proficiencies. 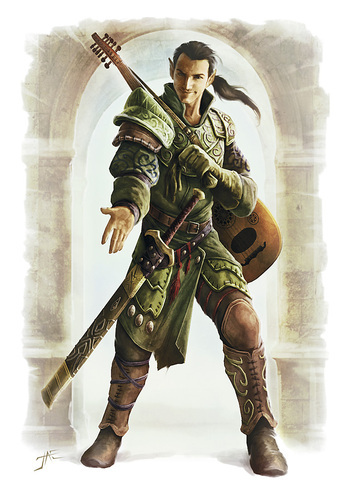 For each minor drawback assigned to a desert elf, you select one of the following: Deception, Endurance, Nature, Sleight of Hand, Stealth, Survival, Spears (Simple), herbalism kit, or a musical instrument (one musical instrument group for our grouped proficiency house rules) or one relevant language. Game Statistics & Lore. 5e D&D Mordenkainen's Tome of Foes chapter 2. Frail (Minor) OR Weak (Minor). 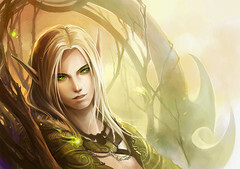 Eladrin are slight of build and slender. Bonus Proficiencies. For each minor drawback assigned to an eladrin, you select one of the following: Arcana, History, Nature, Performance, Persuasion, Survival, Bows (Simple + Martial), Long Blades (Simple), Short Blades (Simple + Martial), or a musical instrument (one musical instrument group for our grouped proficiency house rules) or one relevant language. Elf Weapon Training. If using the weapon group proficiencies house rule, this feature grants proficiency with: Bows (Simple + Martial), Long Blades (Simple), Short Blades (Simple + Martial). Frail (Minor) OR Weak (Minor). High elves have slight builds. Bonus Proficiencies. For each minor drawback assigned to a high elf, you select one of the following: Arcana, History, Nature, Performance, Persuasion, or a musical instrument (one musical instrument group for our grouped proficiency house rules) or one relevant language. Elf Weapon Training. If using the weapon group proficiencies house rule, this feature grants proficiency with: Crossbows (Simple), Spears (Simple + Martial), Whips, Nets & Chains (Simple). Shy (Minor). 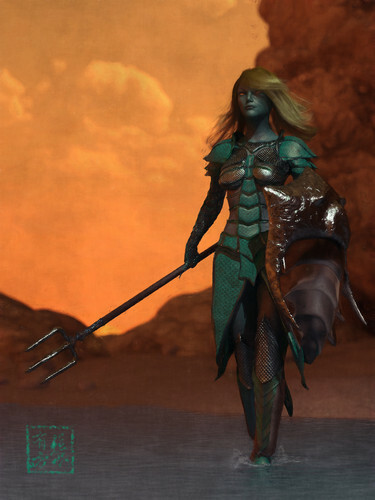 Sea elves have adapted to a life of fending for themselves and only rare individuals come into contact regularly with other races. Outsider (Minor): Wood elves rarely involve themselves with other races. Bonus Proficiencies. For each minor drawback assigned to a sea elf, you select one of the following: Animal Handling, Nature, or Survival or one relevant language. Anti-Social (Minor) ** OR **Not Bright (Minor) OR Shy (Minor). Shadar-kai are all but bereft of free thinking and emotion. Outsider (Minor): Shadar-kai have an aura of strangeness that often unnerves other races. Bonus Proficiencies. 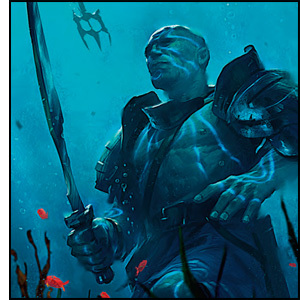 For each minor drawback assigned to a sea elf, you select one of the following: Arcana, Intimidation, Nature, Stealth, Survival or Whips, Nets & Chains (Simple + Martial) or one relevant language. Frail (Minor) OR Shy (Minor). Some wood elves have slighter builds like their high elf brethren, and many are reluctant to engage in social interactions. Bonus Proficiencies. For each minor drawback assigned to a wood elf, you select one of the following: Animal Handling, Athletics, Nature, Stealth, Survival, herbalism kit, or a musical instrument (one musical instrument group for our grouped proficiency house rules) or one relevant language. Game Statistics & Lore. 5e D&D - House (see below). Originally appeared in 3E D&D compatible Monte Cook's Arcana Unearthed chapter 2. Further Lore & Roleplaying Ideas. This race encompasses to diminutive fey races that are both able to change into a third over time if they so choose. Metamorphosis. Faen can change their subrace to that of a spryte. This feature works as described in chapter 2 of Monte Cook's Arcana Unearthed and requires the racial faen feat, Faen Metamorphosis. Thereafter you replace your subrace features with those of the spryte subrace below. I will deal with the spryte subrace if anyone is ever interested in this option. Darkvision. You can see in dim light within 60 feet of you as if it were bright light, and in darkness as if it were dim light. You can't discern colour in darkness, only shades of grey. Your fey senses are sharp and adjusted to moonlight and dim forest conditions. Languages. 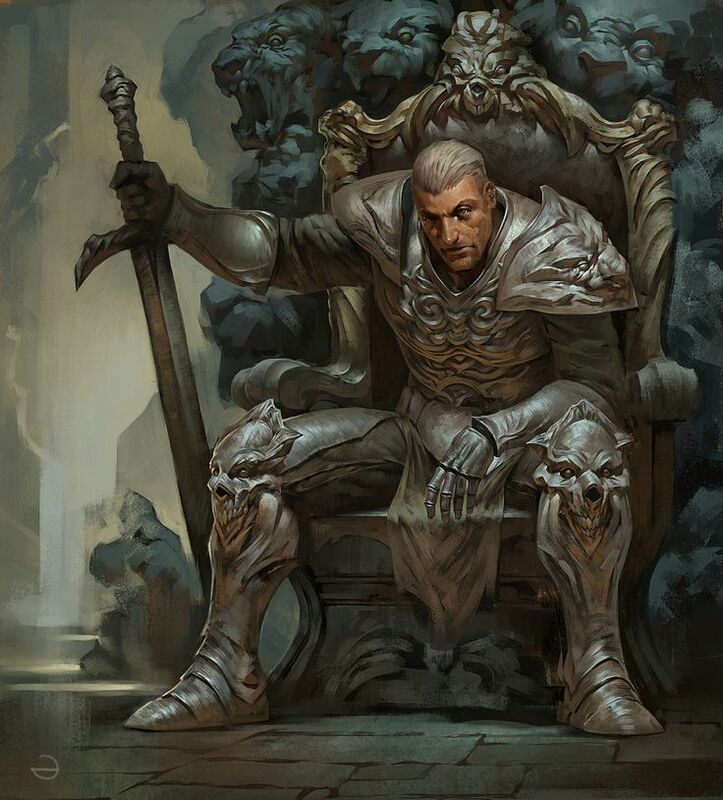 Common and Sylvan (or Faen if using the setting of the Diamond Throne). A starting character begins as a loresong or quickling; you cannot choose sptrye as your first subrace unless you have also taken the relevant racial feat. Loresong Magic. You know the minor illusion and light cantrips. Once you reach 3rd level, you can cast detect magic once with this trait, and you regain the ability to do so once you finish a long rest. You do not need to provide material components for spells cast using this feature and Intelligence is your spellcasting ability for these spells. Speed. Base speed is 20 feet. Curious (Minor). Faen have a love of fun and mystery, but they also value security, so they are constantly checking their surroundings. Loresongs' fascination with magic is also a strong attraction. Delicate (Minor). All faen are of very light builds. Weak (Minor). Faen have light builds and are small in size. Bonus Proficiencies For every minor drawback assigned to a loresong, you choose one of the following. Arcana, Investigation, Perception, Performance, Stealth or any musical instrument (or musical instrument group if using our house rules for proficiencies) or one relevant language. Ability Score Increase. Your Dexterity score increases by 1 (for a total increase of 2). Speed. Base speed is 120 feet. Curious (Minor). Faen have a love of fun and mystery, but they also value security, so they are constantly checking their surroundings. Quicklings' fascination with magic is also a strong attraction. Bonus Proficiencies For every minor drawback assigned to a quickling, you choose one of the following. Acrobatics, Perception, Performance, Stealth or any musical instrument (or musical instrument group if using our house rules for proficiencies) or one relevant language. Lumbering (Minor) OR Shy (Minor). 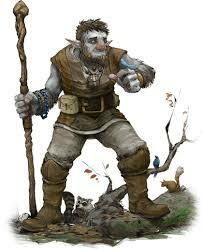 Your bulk means you are not as agile or flexible as other races and firbolgs are renowned for keeping to themselves. Bonus Proficiencies. For each minor drawback assigned to a firbolg, you select one of the following: Animal Handling, Nature, Survival, or herbalism kit or one relevant language. Game Statistics & Lore. 5e D&D Princes of the Apocalypse Appendix A and Elemental Evil Player's Companion. Further Lore & Roleplaying Ideas. 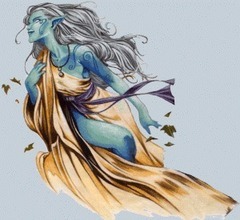 Genasi (first appearance in D&D as gensai) represent those plane-touched by elemental forces. 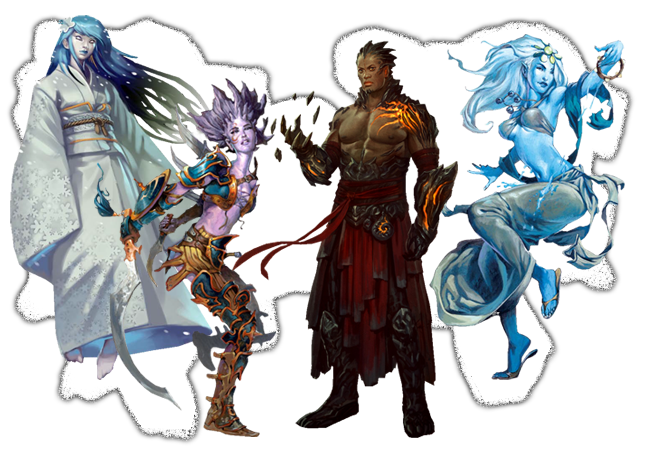 In Kage, humans were shaped by their chief deity, Saradanthule, from five elements, and genasi appear from time to time as living embodiment of Saradanthule's blessing. Not all genasi need to be part human though. 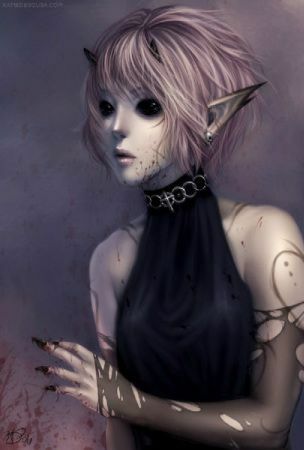 In some settings, genasi blood may appear amongst other races. 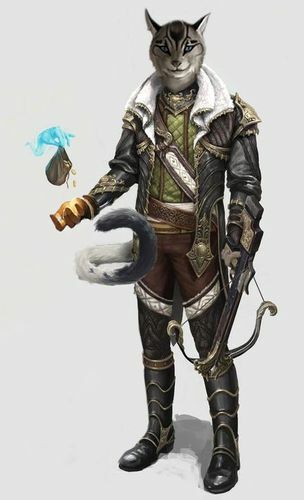 Whilst you could just describe your genasi as appearing like another race, it would be easy enough, with the GM's permission to combine this race with the core features of another race. 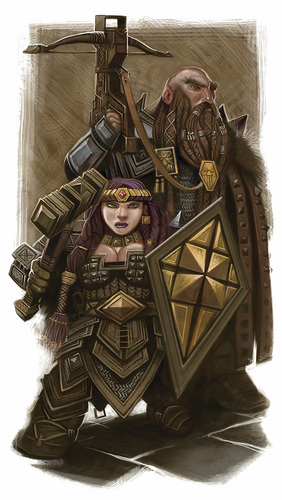 Earth genasi-dwarves for example could live as 'blessed' members of their race. In some settings you might even align the different elements up with different races, much as we have done with the different human groups of Kage. The main thing to watch for is ability score bonuses - there still should only be increases to two of them. Game Statistics & Lore. 5e D&D Princes of the Apocalypse Appendix A. Haughty (Minor) OR Cocky (Minor). Air genasi are flamboyant and confident which may lead to arrogance and over-confidence. Insensitive (Minor) OR Weak (Minor). Air genasi concern themselves with their own state of mind; not others. They are typically more flexible than strong. Bonus Proficiencies. For each minor drawback assigned to an air genasi, you select one of the following: Acrobatics, Performance, Blowguns (Simple), Bows (Simple), Crossbows (Simple), Thrown & Slings (Simple), woodwind instruments or sailed vehicles or one relevant language. Haughty (Minor) OR Cautious (Minor). Some genasi (especially those that are descended from dao) tend to look down on lesser beings and earth genasi tend to avoid rash decisions. Insensitive (Minor) OR Stubborn (Minor). 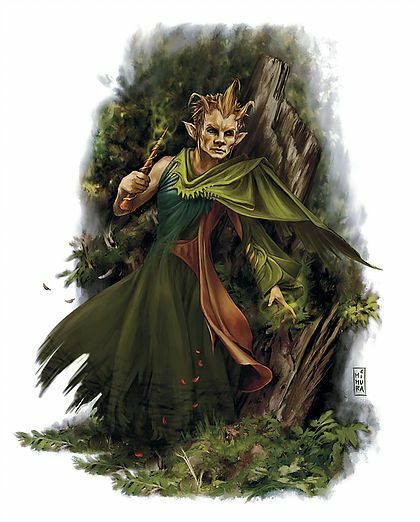 Earth genasi are quite often withdrawn or have trouble dealing with creatures not of earth. Other earth genasi are blatantly stubborn and unwilling to compromise. Landlubber (Minor). You are uncomfortable when not on solid ground. The drawbacks of this feat also apply if you are airborne. Bonus Proficiencies. For each minor drawback assigned to an earth genasi, you select one of the following: Endurance, Intimidation, Axes & Picks (Simple + war pick), Hammers & Maces (Simple + Martial), or mason's tools or one relevant language. Haughty (Minor) OR Curious (Minor). You might flaunt your perceived superiority over common folk or act upon your impatience and throw yourself into situations without thinking them through. Insensitive (Minor) OR Weak (Minor). Fire genasi are often unconcerned how their tempers affect others and some simply do not have strong builds. Bonus Proficiencies. 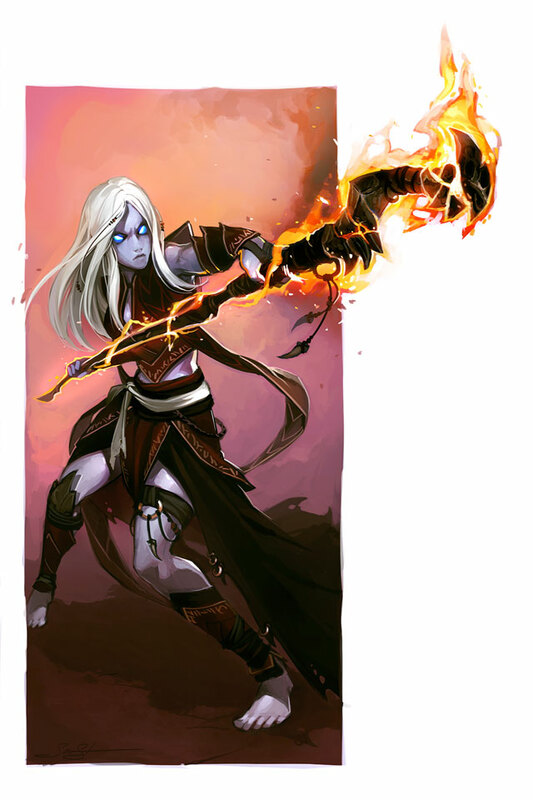 For each minor drawback assigned to a fire genasi, you select one of the following: Acrobatics, Intimidation, Investigation, Performance, or Persuasion or one relevant language. Further Lore & Roleplaying Ideas. Metal genasi are not really part of the D&D literature. These have been created specifically for our setting of Kage. 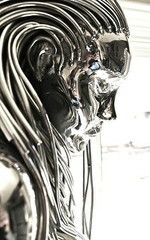 The humans of Gar-Sanya were created from metals by the creator god and from time to time this heritage shows up in individuals from that continent. They are typically treated as 'greater beings' or 'blessed' and with this, as well as an inner strength comes great confidence and presence (not unlike an aasimar). Skin Shield. You can cast the blade ward cantrip as a bonus action. Constitution is your casting ability for this spell. Overconfident (Minor). Metal genasi have a very strong sense of self and can come across as cocky. They walk with bravado, but do not cope well with failure. Magnet (Minor). Sometimes, when you don't have your blade ward on, metallic weapons are actually attracted to you. Super Conductor (Minor). Naturally, you want to avoid storm mages. Bonus Proficiencies. For each minor drawback assigned to a metal genasi, you select one of the following: Endurance, Persuasion, Axes & Picks (Simple), Long Blades (Simple + Martial), Short Blades (Simple + Martial), or smith's tools or one relevant language. Anti-Social (Minor) OR Weak (Minor). Water genasi often value solitude and can come across as selfish. Some lack the strength of other races. Bonus Proficiencies. For each minor drawback assigned to a water genasi, you select one of the following: Endurance, Hooks & Sickles (Simple), oared vehicles or sailing vehicles or one relevant language. Game Statistics & Lore. 5e D&D Mordenkainen's Tome of Foes chapter 4. Further Lore & Roleplaying Ideas. 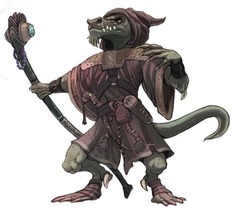 Gith also appear in the 5E D&D MM. The gith were once one race that split into two following their liberation from the mind flayers. The two groups despise each other. Further Lore & Roleplaying Ideas. Githyanki do not have a long tradition of being a playable character race. This idea was introduced in 5E D&D. Martial Prodigy. The individual weapon proficiencies become proficiency in Long Blades (Simple + Martial) and Short Blades (Simple + Martial) if using our weapon group proficiencies. Frail (Minor) OR Socially Inept (Minor). Gith are self-centered and have a slender build. Mean (Minor). Githyanki despise all other races and are very aggressive in their dealings. This does not apply to other githyanki. Outsider (Minor). Githyanki are outright xenophobic. Bonus Proficiencies. For each minor drawback assigned to a githyanki, you select one of the following: Athletics, Endurance, Intimidation, Perception, or any one weapon group proficiency (Simple) or one relevant language. Further Lore & Roleplaying Ideas. 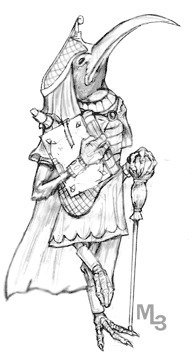 Githzerai are disciplined outsiders that appeared as player character races in the 3.5E D&D Expanded Psionics Handbook (p11) and the 4E D&D Player's Handbook (p8). Frail (Minor) OR Socially Inept (Minor) OR Dull (Minor). Gith are self-centered, have a slender build and trust intuition more than logic. Outsider (Minor). Githzerai are isolationists. Cautious (Minor)**. Githzerai keep a calm demeanor at all times are disciplined and calculating. Bonus Proficiencies. For each minor drawback assigned to a githzerai, you select one of the following: Acrobatics, Athletics, Insight, Perception, or Brawling Weapons (Simple) or one relevant language. Further Lore & Roleplaying Ideas. Racial descriptions for typical gnomes can be found in many products. 5E D&D Mordenkainen's Tome of Foes chapter 5 contains a wealth of lore for all gnomes. Game Statistics & Lore. 5e D&D Mordenkainen's Tome of Foes chapter 5, 5E D&D Sword Coast Adventurer's Guide chapter 3 and Elemental Evil Player's Companion (all same material). Further Lore & Roleplaying Ideas. In many standard D&D settings, these gnomes are known as svirfneblin, and like other Underdark races they typically have magical powers. Anti-Social (Minor). Deep gnomes avoid encounters with other beings. Outsider (Minor). Deep gnomes are extremely reclusive and do not trust others, and are oddities to most other races. Bonus Proficiencies. For each minor drawback assigned to a deep gnome, you select one of the following: Endurance, Investigation, Perception, Stealth, Axes & Picks (Simple), jeweler's tools or mason's tools or one relevant language. Bonus Racial Feat. For the major drawback assigned to a deep gnome, you select one gnome racial feat. For D&D svirfneblin this is usually the Deep Gnome Magic racial feat. Further Lore & Roleplaying Ideas. 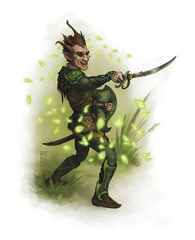 Fey gnomes represent the ones native to the Feywild, made common in 4E D&D. Extra Language. You can speak, read and write either Elven or Sylvan. Fade Away. When you take damage, you can use your reaction to turn invisible. You remain invisible until you attack, cast a spell, or until the end of your next turn. You must finish a short rest before you can use this feature again. Fey Ancestry. You have advantage on saving throws against being charmed, and magic cannot put you to sleep. Reactive Stealth. 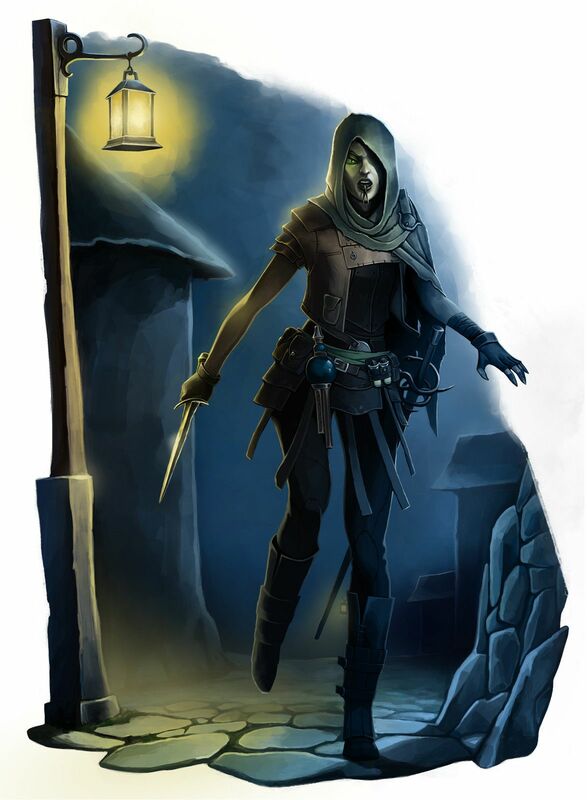 If you have any cover or concealment when you make an Initiative check, you can also make a Dexterity (Stealth) check to hide. Weak (Minor). All gnomes are small and this limits their physical power. Insensitive (Minor). Fey gnomes are often unaware of the effects their tricks and deceptions may have on others. Or they simply don't care. Bonus Proficiencies. For each minor drawback assigned to a fey gnome, you select one of the following: Animal Handling, Arcana, Nature, Perception, Persuasion, Stealth, Survival, woodcarver's tools, herbalism kit or a instrument group (or one instrument group if using our grouped proficiencies house rule) or one relevant language. Shy (Minor). Forest gnomes rarely mix with other races. Even wood elves are often surprised to find them in their forests sometimes. Bonus Proficiencies. For each minor drawback assigned to a forest gnome, you select one of the following: Animal Handling, Arcana, Nature, Perception, Stealth, Survival, woodcarver's tools, herbalism kit or musical instrument (or a musical instrument group if using our grouped proficiencies house rule) or one relevant language. Vague (Minor). Tinker gnomes focus intently on their work, but often pay little attention to the people and world around them. Bonus Proficiencies. For each minor drawback assigned to a rock gnome, you select one of the following: Arcana, Investigation, Crossbows (Simple + Martial), set of artisan's tools, or Thieves' tools or one relevant language. Further Lore & Roleplaying Ideas. 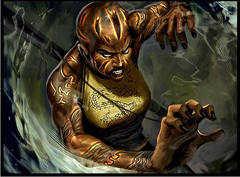 There is a lot of lore on the yuan-ti in chapter 1 of Volo's Guide to Monsters too. Annoying (Minor) OR Unwise (Minor). Goblins can't help but be annoying. Of course, if they think they can beat up another creature this turns to bullying. They are not known for making wise decisions either. Outsider (Minor). Outside goblinoid societies, goblins are rarely welcomed. Weak (Minor). Goblins may be feisty, but the lack bulk. Bonus Proficiencies. 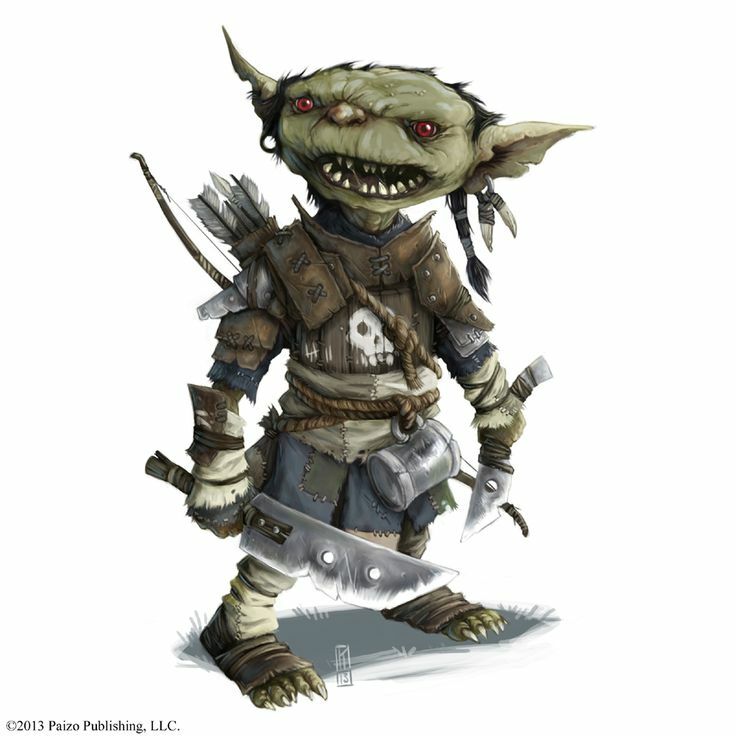 For each minor drawback assigned to a goblin, you select one of the following: Acrobatics, Animal Handling, Perception, Stealth, Slight of Hand, Bows (Simple), Brawling Weapons (Simple), or Short Blades (Simple) or one relevant language. Game Statistics & Lore. 5e D&D Volo's guide to Monsters chapter 2 and and Elemental Evil Player's Companion. Further Lore & Roleplaying Ideas. 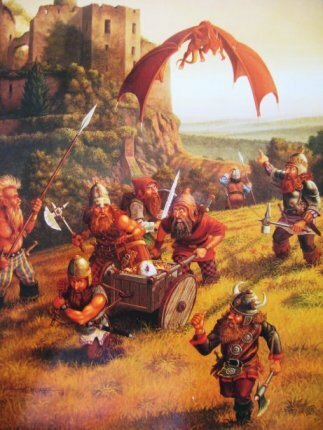 The competitive goliaths of the mountains appear in the 3E D&D Races of Stone, and the 4E D&D Player's handbook 2. Lumbering (Minor) or Shy (Minor). Your bulk means you are not as agile or flexible as other races and goliaths tyically live in isolation and are self-reliant. Outsider (Minor). You are from an isolated mountain home and this applies when dealing with lowlanders. Goliaths commonly trade with dwarves, so it does not apply to them. Bonus Proficiencies. For each minor drawback assigned to a goliath, you select one of the following: Endurance, Insight, Intimidation, Survival, or leatherworker's tools or one relevant language. Further Lore & Roleplaying Ideas. 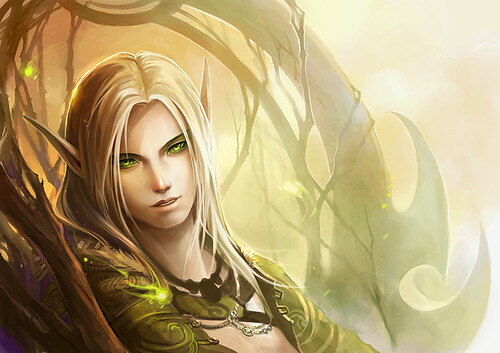 Racial descriptions for typical half-elves can be found in many products. 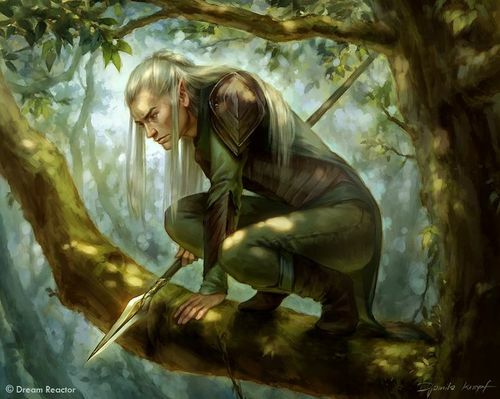 The following drawbacks try to cover several views of half-elves, including those that act as great diplomats between humans and elves, those that were raised among one of their parent races, or those that do not fit into either culture. It often depends upon the setting (and edition of the game) as to where half-elves belong. The Dungeons & Dragons 4th & 5th Edition Player's Handbooks describe half-elves that are very good intermediaries between the races. The Pathfinder Core Rulebook describes half-elves as adaptable. 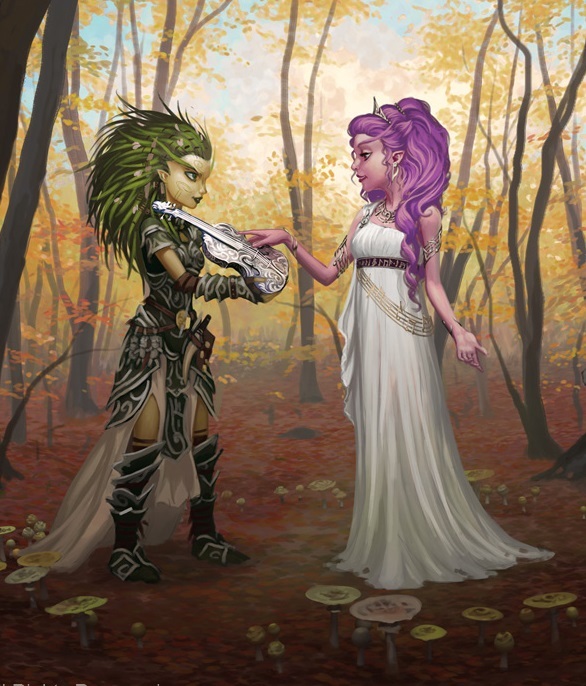 In 13th Age half-elves are a symbol of friendship between the elves and humans. 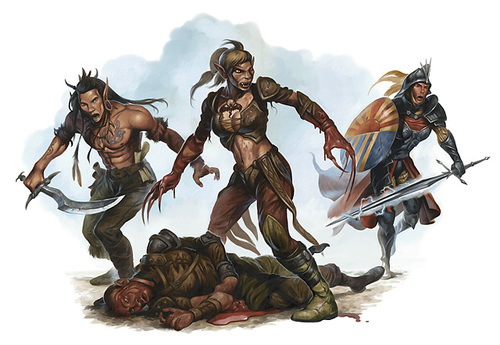 Savage Worlds (and some earlier versions of Dungeons & Dragons) describe half-elves that are outsiders to their parents' races. The features suggest a human - high elf union, but the 'elf' side could easily be adapted to suit other elven subraces. Outsider (Minor). Choose a particular society/group amongst who you were raised (typically an elven subrace or human culture). The penalties of this feat do not apply when interacting with members of that race. Wayward (Minor Racial). You gain the Outsider flaw, but the penalties ONLY apply amongst elves and humans. You do not fit into either of your parents' worlds. This may represent settings where half-elves are looked down upon. Bonus Proficiencies. 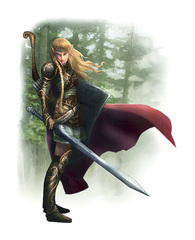 For each minor drawback assigned to a half-elf, you select any one skill, weapon group or tool sets/kits. (If the Short Blades weapon group is chosen, you gain Simple + Martial. For all other weapon groups it is Simple only) or one relevant language. The half-elf above describes a mixture of human and high elf. In time, we may add variant mixed heritages below. Game Statistics & Lore. 5e D&D stats, House (see below). 3E D&D Expanded Psionics Handbook chapter 1. Further Lore & Roleplaying Ideas. Half-giant society is described in the 2E D&D Dark Sun setting, though these guys were 10-12 feet tall. In 3E D&D they were described in the Expanded Psionics Handbook where they are 7-8 feet tall (and that is the size used below). Being a Dark Sun creation, half-giants are portrayed as psionic. (4E D&D Dark Sun just used the goliath race). Desert Born. You're naturally adapted to extreme heat, as described in chapter 5 of the Dungeon Master's Guide. You also ignore movement penalties for sandy or rocky conditions. Psionic Stomp. You can stamp your foot and send a psionic ripple through the earth. You can cast earth tremor as a 1st level spell (from the 5E D&D Xanathar's Guide to Everything or Elemental Evil Player's Guide) without needing a material component. After you use this trait, you can't use it again until you finish a short or long rest. Wisdom is your spellcasting ability for this spell. (If you do not wish to play a psionic half-giant, replace this with Stone's Endurance from the goliath entry). Primitive (Minor). This is typical for the half-giants of Dark Sun, where metal is very rare. Half-giants from other settings may not be assigned this drawback. Bonus Proficiencies. For each minor drawback assigned to a half-giant, you select one of the following: Athletics, Endurance, Survival, or Clubs & Staffs (Simple + Martial) or one relevant language. Further Lore & Roleplaying Ideas. 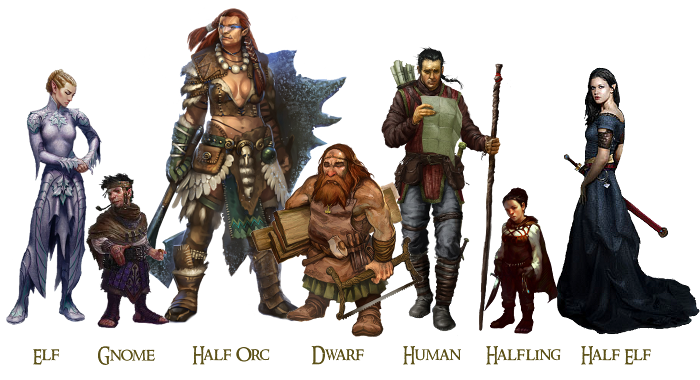 Earlier versions of half-orcs from most games (including Dungeons & Dragons) describe half-orcs as being the result on an unwanted union. This is the case in Pathfinder Core Rulebook and Savage Worlds too. More recent interpretations, such as in 13th Age suggest it is a race apart. 4th Edition Dungeons & Dragons also takes this approach, offering several suggestions for the origins of the race. 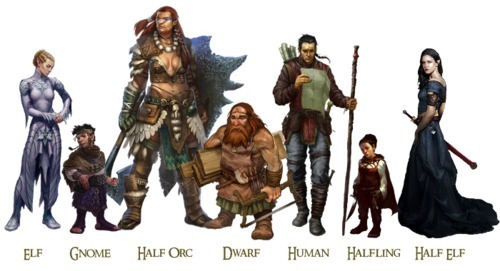 The 3E Races of Destiny has a lot of information on half-orcs. Socially Inept (Minor) OR Dullard (Minor). 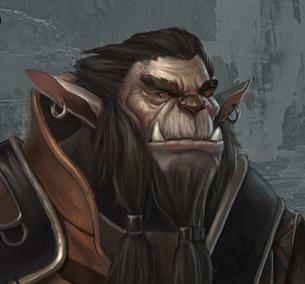 Many half-orcs have grown up having difficulty communicating and others have inherited their lack of wit from their orcish heritage. Outsider (Minor). 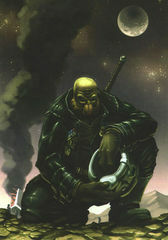 Half-orcs often have difficulty dealing with civilised races; (and in some settings they are not accepted by orcs either). Bonus Proficiencies. 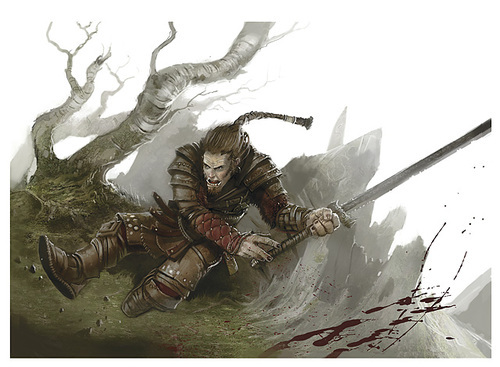 For each minor drawback assigned to a half-orc, you select any one of the following: Athletics, Endurance, Intimidation, Axes & Picks (Simple + Martial), Brawling (Simple + Martial), Clubs & Staffs (Simple + Martial), Long Blades (Simple + Martial), Spears (Simple + Martial) or one relevant language. The half-orc above describes a race that has bred true over time. It could also represent a union between orc and human. In settings where there are distinctive orc races, there may also be differing half-orcs. Further Lore & Roleplaying Ideas. Racial descriptions for halflings can be found in many products, from all editions of D&D, to the Hobbits of Tolkien's Middle Earth and the 13th Age core book. 5E D&D Mordenkainen's Tome of Foes chapter 5 contains a wealth of lore for all halflings. Bonus Proficiencies. For each minor drawback assigned to a lightfoot halfling, you select one of the following: Acrobatics, Animal handling, Persuasion, Stealth, Thrown & Slings (Simple), any 1 vehicle (or vehicle group if using our grouped proficiency house rule) or one relevant language. Further Lore & Roleplaying Ideas. These halflings are based on cannibalistic nature-loving halflings of the 2E & 4E Dark Sun setting. Bonus Proficiencies. 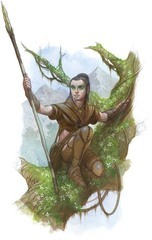 For each minor drawback assigned to a jungle halfling, you select one of the following: Acrobatics, Endurance, Nature, Stealth, Survival, Blowguns (Simple + Martial), Brawling weapons (Simple + Martial), Spears (Simple), Thrown & Slings (Simple + Martial) or herbalism kit or one relevant language. Bonus Proficiencies. For each minor drawback assigned to a stout halfling, you select one of the following: Endurance, Animal Handling, Nature, Stealth, Short Blades (Simple), Thrown & Slings (Simple) or one relevant language. Further Lore & Roleplaying Ideas. This subrace represents any hawk or eagle-like birdfolk. They are a creation from Kage where they serve as a guardian race and are known to be proud with strong sense of honor and the divine. They are distinguished from aarakocra by their larger size, lack of connection to the Elemental Plane of Air, and different outlook.They may have once been members of the same race, but harkrinn have adapted better to life on the ground and their larger size limits their flight. Harkrinns are humanoid birdfolk. They have the exceptional perception of birds of prey. 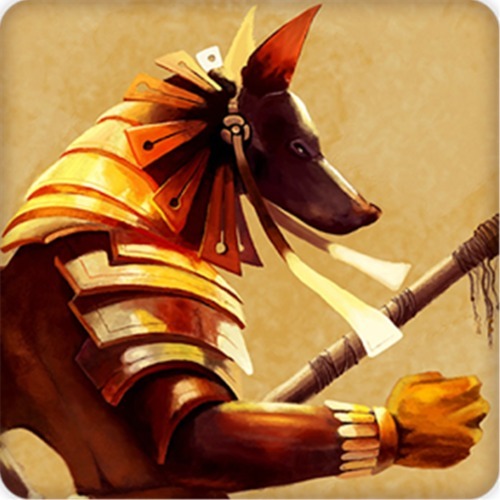 They have a strong sense of community and pride themselves on their noble behaviour and reverence of the gods. Their wings allow them to glide and some develop allowing flight. • Play a race that combines animal features with a humanoid form. • Be exceptionally perceptive and gain the ability of flight. • Be noble and aloof. Physical Qualities. Harkrinns generally stand taller than the average human. They combine hawk or eagle-like features with a humanoid form. Feathers cover most of their body and vary in colour, though browns and greys are most common. Eyes are bird-like and typically golden, brown or black. Harkrinns have a curved beak like a bird of prey, taloned feet and long dark nails on their hands. Their most distinguishing feature is however, a large set of wings that fold across their back. Wings typically have a span of twice the harkrinn’s height. Average Weight: 140 - 190 lb. Perceptive & Proud. Above all, harkrinns are a proud and noble race. To others they may seem aloof, but if dealt with honourably harkrinns are actually very accepting of other races and enjoy conversation and song. They are also very perceptive, both in sight and insight. They constantly look for betrayal in others and if they detect a ruse their ire rises rapidly. Homes on the Ground. Harkrinns used to live on cliff aeries, but since befriending dwarves, have taken to living in safer tunnels carved into such cliffs. Others also live similar to elves in crude treetop dwellings. Devout. Whilst the harkrinns respect the natural world, few today draw their powers from the primal power source. The race is very religious and often sees itself as the closest to the deities (both in demeanour and in dwelling). Thus a good many harkrinn heroes and leaders are clerics or paladins. Many deities are revered with those of lawful good alignment being most popular. Harkrinn Names. Harkrinn names are long and unpronounceable in the Common tongue. They generally adopt nicknames for other races to call use. There are no differences between male or female names. Male and Female Names: Bladebeak, Cloudwings, Daggertalon, Spirehunt, Silentdeath, Stormclaw, Sunstrike, Swordstare. Ability Score Increase. Your Wisdom score increases by 2 and your Charisma score increases by 1. Age. Harkrinn life spans are comparable to those of humans. Avian Affinity. You have advantage on all Wisdom (Animal handling) rolls with avian beasts. Exceptional Eyesight. You gain proficiency in the Wisdom (Perception) skill and can see twice as far as a human. Limited Flight. On your turn you can fly your speed when you move. If you do not land at the beginning of your next turn you must glide (as detailed under Wings) as your movement. If you are unable to glide you fall. Natural Weapons. Harkrinn have sharp beaks and legs end in sharp talons. These can be used as natural weapons, dealing 1d4 slashing damage. (You are not proficient in the use of these weapons unless you take the Natural Weapons Group proficiency). Wings. For a harkrinn's wings to be able to function, they must have a number of feet equal to their height free on both sides of them. If their wings can be used, a harkrinn gains advantage on Strength (Athletics) checks made to jump, can ignore falling damage, or glide forward 2 feet for every 1 foot descended. You have disadvantage on Strength (Athletic) checks made to swim. Languages Common and Elven or Dwarven. Aversion (Minor). Applies to snake-like beasts and when interacting with serpentfolk such as serpentine/yuan-ti. This may not be common to all settings. Dullard (Minor) OR Frail (Minor) OR Weak (Minor). There is not a real standard weakness across all harkrinns, though each of these are common enough. Honorable (Minor). Harkinns pride themselves on their noble bearing and honourable behaviour. Although they may come across as aloof initially, they are actually very accepting of other races and enjoy conversation and song. Bonus Proficiencies. For each minor drawback assigned to a harkrinn, you select one of the following: Endurance, Insight, Intimidation, or Religion or one relevant language. Further Lore & Roleplaying Ideas. 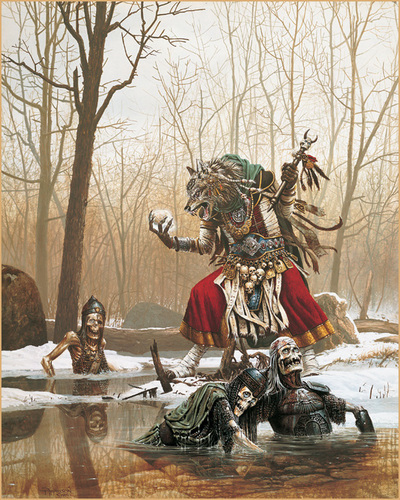 There is a lot of lore on hobgoblin's in chapter 1 of Volo's Guide to Monsters too. Martial Training. If using our weapon group proficiency house rules, this grants proficiency in Simple and Martial weapons for two groups. Outsider (Minor). Hobgoblins are universally feared and hated, so initial reactions are always going to be strained. Bonus Proficiencies. 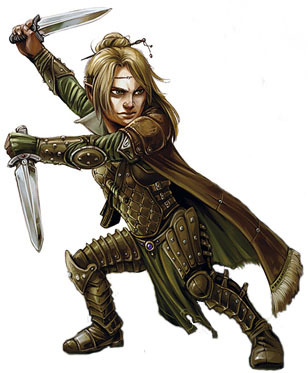 For each minor drawback assigned to a hobgoblin, you select one of the following: Endurance or any weapon group proficiency (Simple + Martial) or one relevant language. Further Lore & Roleplaying Ideas. Racial descriptions for typical humans can be found in many products. 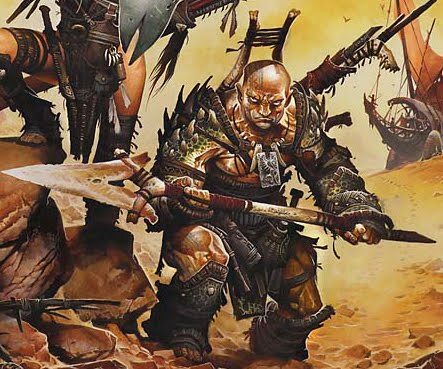 The 3E Races of Destiny is a good source for a more detailed look at humans and their place in the D&D world. Humans do not generally have subraces, though these may be possible in various settings. As we use feats, the 'Variant Human Traits' can be used. (Again, human traits may even be assigned by 'subrace' if the DM decides to develop them for individual settings). As humans are the baseline to which others are compared and they vary considerably, there are no set drawbacks common to all humans. DMs are encouraged to assign specific flaws to humans of a certain region, culture or 'subrace'. Further Lore & Roleplaying Ideas. These humanoids represent any ibis or heron-like birdfolk. They are a creation from Kage where they serve as a guardian race and are known for their love of knowledge and studious ways. Of particular note is the lack of wings on the ibisil. Ability Score Increase. Your Intelligence score increases by 2, and your Wisdom score by 2. Ibisil Scrutiny. You have advantage on checks made to decipher, understand or identify forgeries when dealing with written text including runes and magical writing. Speed. Base speed is 25 feet. Water Born. You ignore movement penalties for wading through water and moving through swamp and marsh terrain. Armor Avoidance (Minor racial). Armor is typically too heavy for your frail frame and is uncomfortable over your feathers and sensitive shoulder nodules. Frail (Minor). All ibisils are slight of build, with very thin and easily broken limbs. Weak (Minor). Ibisils have little strength and are on the shorter end of Medium size. Brittle Bones (Major). Ibisil still have light bone structure despite losing the gift of flight some time ago. Bonus Proficiencies. For each minor drawback assigned to an ibisil, you select one of the following: Arcana, History, Investigation, Medicine, Nature, Religion, calligrapher's supplies, weaver's tools, herbalism kit or oared vehicles or one relevant language. Bonus Racial Feat. For the major drawback assigned to an ibisil, you select one ibisil racial feat. Further Lore & Roleplaying Ideas. 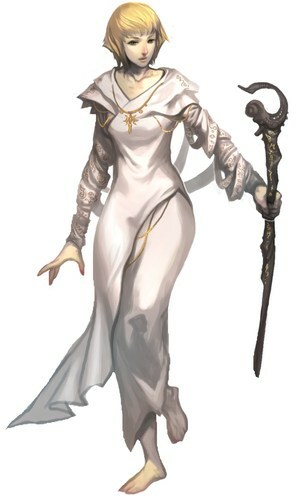 Kalashtar were a player race from Eberron campaign setting. The 3rd edition description could be used, just as easily as the 4th Edition version from the Eberron Player's Guide. They are basically humans whose ancestors fled the plane of dreams. They have innate psionic ability. Being very human-like there are no drawbacks common to all kalashtar. They already come with quirks that play on their mental instability, but players wishing to take this further may take the Unstable (Minor) drawback. Bonus Proficiencies. If you decide to take the Unstable drawback, you select one of the following: Insight, Intimidation, Performance or Persuasion or one relevant language. Further Lore & Roleplaying Ideas. This race of scheming sneaks able to imitate sound have also been in the D&D game for a long time. Kenku can represent any cross with smaller birds. 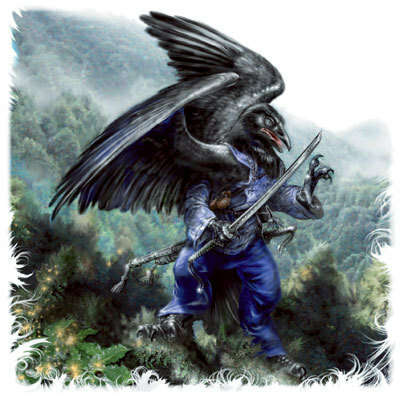 Kenku and tengu may even be different spectrums of the same 'race'. Brittle Bones (Major) OR Weak-Willed (Major). Many kenku still have light bone structure despite losing the gift of flight some time ago. Kenku tend to be followers and are easily led into trouble. Dullard (Minor) OR Frail (Minor) OR Weak (Minor). There is not a real standard weakness across all kenku, though each of these are common enough. Outsider (Minor). Even though they live in urban areas, kenku tend to gather in ghettos and are generally not trusted by other citizens. The kenku's 'speech' can also be very off-putting to others. Bonus Proficiencies. 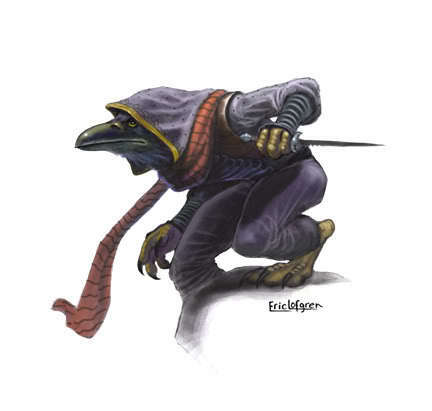 For each minor drawback assigned to a kenku, you select one of the following: Investigation, Perception, Sleight of Hand, Stealth, Streetwise, Short Blades (Simple), or any game set (or gaming group if using our grouped proficiencies) or one relevant language. Bonus Racial Feat. For the major drawback assigned to a kenku, you select one kenku racial feat. Further Lore & Roleplaying Ideas. 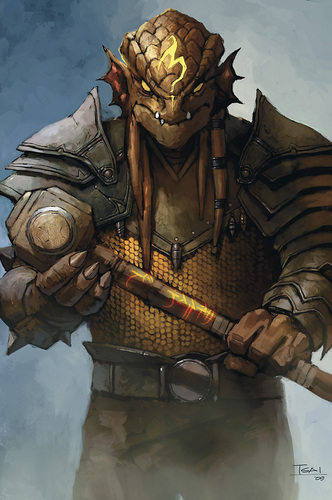 There is a lot of lore on kobolds in chapter 1 of Volo's Guide to Monsters too. Kobolds already have two drawbacks factored into their statistics. So these are not optional and you do not get further benefits for having a penalty to Strength or Sunlight Sensitivity. Outsider (Minor). Kobolds have a strong affinity for dragons, but not other humanoids. Bonus Proficiencies. 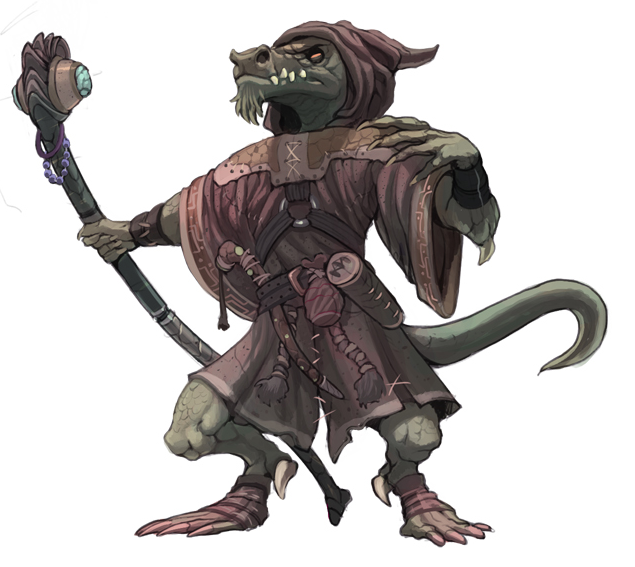 For each minor drawback assigned to a kobold, you select one of the following: Arcana, Endurance, Perception, Stealth, or trapmaker's tools or one relevant language. Game Statistics & Lore. 5e D&D House, (see below). Original appearance and lore in 3E D&D compatible Monte Cook's Arcana Unearthed chapter 2. Further Lore & Roleplaying Ideas. Litorians are nomadic, honour-bound lion-folk. Ability Score Increase. Your Dexterity score increases by 1 and your Strength score increases by 1. Keen Senses. You have proficiency in the Perception skill. Having the senses of a lion means litorians have superior hearing, sight and smell. Natural Weapons: Litorian arms end in retractable claws and they have sharp teeth, both of which can be used as natural weapons, dealing 1d6 slashing damage. (You are not proficient in the use of these weapons unless you take the Natural Weapons group proficiency). Languages. Litorian and Common. (Replace Litorian with Sylvan or Elven for most settings. On Kage this would be Felisian). Aversion (Minor). This is typical to some settings like Kage, but is not common to all settings. Applies to canine beasts and when interacting with canisarans, gnolls and other intelligent canine-folk. Honor-bound (Minor). Litorians have a deep sense of personal honor centered around the notion of being true to oneself. This typically includes avoiding savagery and the use of natural weapons. Outsider (Minor). Catfolk have trouble relating to anyone that has not grown up in the wild. This is not likely to apply in the setting of the Diamond Throne where they are commonly encountered and known for their honorable nature. Self-Centered (Minor). Litorians typically spend a lot of time focusing inward and can be a little unobservant of the actions of others. Bonus Proficiencies. For every minor drawback assigned to a litorian character, choose one of the following: Animal Handling, Athletics, Intimidation, Survival or Natural Weapons or one relevant language. Dullard (Minor) OR Anti-Social (Minor). Lizardfolk care for little but survival and they struggle to understand other humanoids. Outsider (Minor). A harsh life in the swamps and their reptilian appearance and behaviour ensures lizardfolk are looked upon as outsiders in most societies. Primitive (Minor). Lizardfolk do not forge their own weapons; they make them from what is available. Bonus Proficiencies. 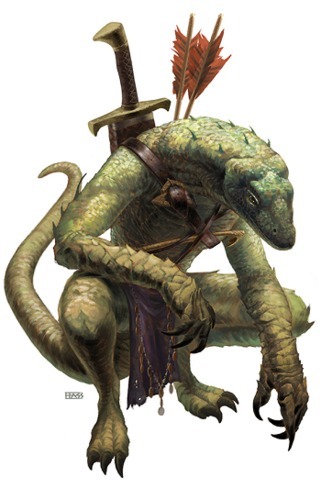 For each minor drawback assigned to a lizardfolk, you select one of the following: Animal Handling, Endurance, Perception, Stealth, Survival, Swim, Axes & Picks (Simple), Clubs & Staffs (Simple), Natural Weapons (Simple), or Spears (Simple) or one relevant language. 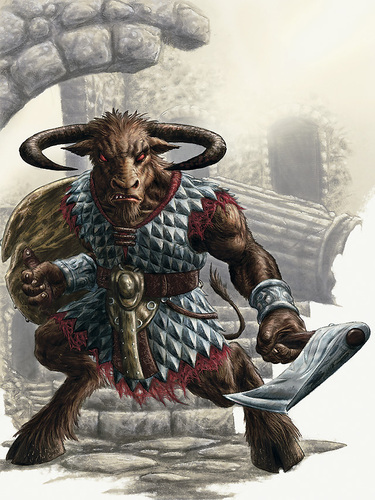 Though usually an enemy, player character minotaurs have appeared in several products and settings. Hammering Horns. When you use the Attack action during your turn to make a melee attack, you can attempt to shove a creature with your horns as a bonus action. (You cannot use this shove attempt to knock a creature prone). Heedless Charge. When you use the Dash action during your turn, you can make a melee attack with your horns as a bonus action. If you hit, you can make a free shove attempt on top of any damage dealt. This shove can be used to knock the target prone. Horns. Your horns are a melee weapon that deals 1d8 piercing damage. Your horns grant you advantage on all checks made to shove a creature, but not to avoid being shoved yourself. (You are not proficient in the use of these weapons unless you take the Natural Weapons Group proficiency). Languages. Common and one other appropriate to the setting (usually Giant). Minotaurs typically do not have their own language. Vitality. When you recover Hit Dice following a long rest, you recover one extra. (So you recover half your level +1 hit dice). Anti-Social (Minor). Minotaurs tend to have an aggressive demeanor. Outsider (Minor). Minotaurs suffer from suspicion to outright hatred from other races. This animosity not only stems from the minotaurs' monstrous appearance, but from the infamy of their race for savage brutality. This subrace is inspired by Dragonlance where minotaurs have had a Viking influence (or Roman for Taladas) and presented here as reaver minotaurs. 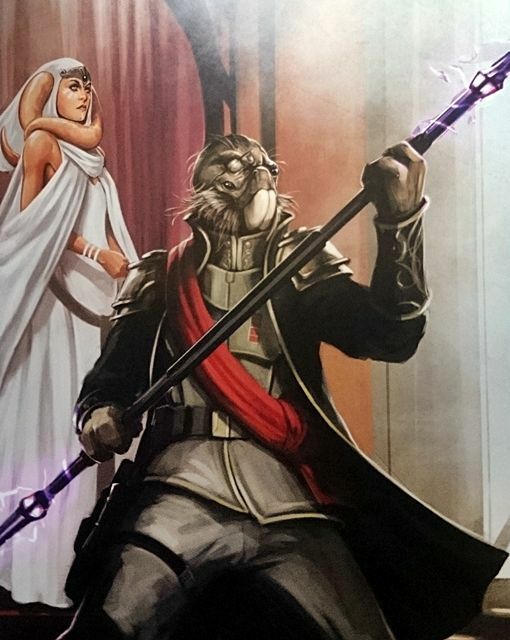 They appeared in a 5E Arcana Unearthed article. Conqueror's Virtue. From a young age, you focused on one of the three virtues of strength, cunning, or intellect. Your choice of your Strength, Intelligence or Wisdom score increases by 1. Bonus Proficiencies. You can choose any 3 proficiencies from: Athletics, Intimidation, Axes & Picks (Simple + Martial), Long Blades (Simple + Martial), Natural Weapons, navigator's tools, vehicles (oared), or vehicles (sailing) or one relevant language. Arrogant (Minor). The sea reaving minotaurs embrace the notion that the weak should perish and he strong must rule. Honor-Bound (Minor). For all their cruelty reaving minotaurs are bound by a powerful sense of honor. Their honor demands that they keep their word once it if given and each minotaur remains faithful to friends and clan above all else. This subrace follows the idea of a being torn between being savage and civilised, from the Dungeons & Dragons 4th Edition Player's Handbook 3. Ability Score Increase. Your Constitution score increases by 1, and your Strength score increases by 1. (For a total of +2 Strength). Bonus Proficiencies. You can choose any 2 proficiencies from: Athletics, Intimidation, Nature, Perception, Survival, Axes & Picks (Simple + Martial), Clubs & Staffs (Simple + Martial), Hammers & Maces (Simple + Martial), Long Blades (Simple + Martial), or Natural weapons or one relevant language. Clumsy (Minor) OR Dullard (Minor). Some minotaurs are uncultured or just unaware of standard knowledge and slow on the up take, and other minotaurs are a little clumsy due to their bulk. Further Lore & Roleplaying Ideas. Mojh are humans that have undergone rituals to become dragon-like. Darkvision. You can see in dim light within 60 feet of you as if it were bright light, and in darkness as if it were dim light. You can't discern colour in darkness, only shades of grey. Your eyes amplify like a dragon's giving you superior vision in dark and dim conditions. Rune Recognition. You have advantage on checks made to decipher, understand or identify forgeries when dealing with written text including runes and magical writing. Tail. A mojh's tail helps it to keep balance. You have advantage on any Dexterity (Acrobatics) check to keep your balance. Outsider (Minor). Mojh are separatists and purposely isolate themselves from other races. Anti-Social (Minor) OR Frail (Minor). Mojh rarely mix with others and many are quite thin and less sturdy than humans. Bonus Proficiencies. For every minor drawback assigned to a mojh character, choose one of the following: Acrobatics, Arcana, Intimidation, Investigation or calligrapher's supplies or one relevant language. Further Lore & Roleplaying Ideas. 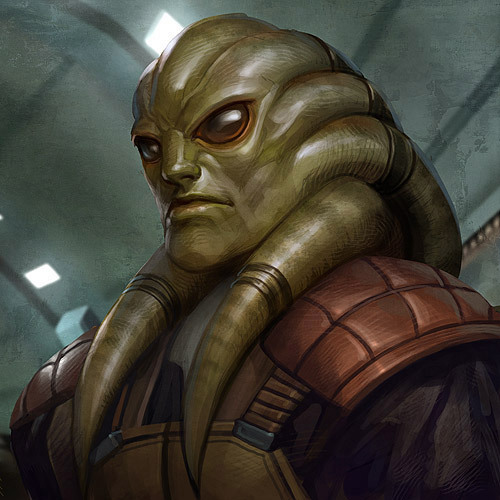 Details on nautolans can be found in the Star Wars Saga RPG in the Clone Wars Campaign Guide (p15) and here on Wookiepedia. Here is an aquatic race from the Star Wars setting I have used before. In fact, the Nautolans are probably my favourite Star Wars species and I think make a perfect fantasy amphibious race. I even made a fantasy mini of a nautolan with a sword and shield (after removing 2 blasters). Of course there are some good Kit Fisto figures where the removal of his light saber would work too. Ability Score Increase. Your Constitution score increases by 2, and your Dexterity by 1. Amphibious. Nautolans can breathe air and water. Swim. You have a swim speed of 30 feet. Pheromone Sensors: Advantage on Wisdom (Insight) rolls against targets within 5 feet. (This extends to 30 feet underwater). A nautolan's head tendrils 'read' pheromones. Dullard (Minor) OR Unwise (Minor). 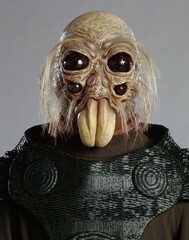 Nautolans rely too much upon instincts and their mental state is easily affected by those around them. Loyal (Minor). Nautolans are loyal and steadfast companions. Outsider (Minor). Applies to all interactions with non-aquatic creatures. Pheromone sensors (Racial Minor Flaw): If another creature within 5 feet of you displays a strong emotion, such as fear, anger or hatred, you must make a DC 10 Wisdom save or replicate that emotion. (This extends to 30 feet underwater). This often means taking on background flaws, drawbacks or a condition such as Frightened temporarily, or even abiding by the restrictions of something like a barbarian's rage. The absorption of pheromones through the head tendrils can cause unwanted chemical changes. This is why a nautolan's mood often replicates the strongest emotion around them. Bonus Proficiencies. For each minor drawback assigned to a nautolan, you select one of the following: Acrobatics, Endurance, Insight, Intimidation, Performance, Persuasion, or one musical instrument group or one relevant language. There are no subraces for the generic nautolan race, though in a setting where there are many, cultural ones could be generated. Further Lore & Roleplaying Ideas. There is a lot of lore on orcs in chapter 1 of Volo's Guide to Monsters too. Orcs already have a drawback factored into their statistics. So, this is not optional and you do not get further benefits for having a penalty to Intelligence. Anti-Social (Minor) OR Dullard (Minor). Orcs are certainly not known for their pleasantries and can often come across as stupid, despite their cunning. (If you take the Intelligence reduction, this is on top of the penalty that already applies to orcs). Outsider (Minor). Civilised societies see orcs a savages and a lone orc will find it difficult to break down common perceptions. Violent (Minor). Aggression is core to an orc's being. Bonus Proficiencies. For each minor drawback assigned to an orc, you select one of the following: Athletics, Axes & Picks (Simple + Martial)Brawling Weapons (Simple + Martial), or Spears (Simple + Martial) or one relevant language. Further Lore & Roleplaying Ideas. Shardminds are psionic creatures formed from physical and psychic crystals. Their description is from the 4E D&D Player's Handbook 3. Further Lore & Roleplaying Ideas. Shifters are characters with some lycanthrop blood that have long been associated with the Dungeons & Dragons setting of Eberron. The 3rd edition description could be used, just as easily as the 4th Edition version from the Player's Handbook 2. Bonus Proficiencies. For each minor drawback assigned to a beasthide shifter, you select one of the following: Endurance, Intimidation, Survival, or Natural weapons (claws can be used for unarmed strikes) or one relevant language. Bonus Proficiencies. For each minor drawback assigned to a longtooth shifter, you select one of the following: Athletics, Acrobatics, Endurance, Survival, or Natural weapons or one relevant language. Bonus Proficiencies. For each minor drawback assigned to a swiftstride shifter, you select one of the following: Athletics, Stealth, Survival, Brawling weapons (Simple), Natural weapons or one relevant language. Bonus Proficiencies. For each minor drawback assigned to a wildhunt shifter, you select one of the following: Athletics, Endurance, Insight, Nature, Stealth, Natural weapons or one relevant language. Further Lore & Roleplaying Ideas. Sibeccai are canine-folk that are strongly tied to the giants in the Diamond Throne setting. They are a militaristic race, often serving as guards and soldiers. Ability Score Increase. Your Constitution score increases by 2 and your Dexterity score increases by 1. Darkvision. You can see in dim light within 60 feet of you as if it were bright light, and in darkness as if it were dim light. You can't discern colour in darkness, only shades of grey. Your canine eyes allow you to see better in the dark. Martial Training. Sibeccai have an inherent knowledge of weapons. When they learn the basics of a type of weapon, they can use all related weapons. You are proficient in 3 martial weapons of your choice. If using our weapon group house rules, you gain proficiency (Simple + Martial) in one weapon group of your choice. Furthermore, if you gain any Simple weapon group proficiencies you also gain proficiency in the martial weapons of that group. Arrogant (Minor). Does not apply to other sibeccai or giants. They see themselves as the 'chosen' race; the giants chose them over other races. Aversion (Minor). Sibeccai do not like litorians and this dislike often extends to all felines and feline-like races. Dullard (Minor) OR Anti-Social. Sebeccai can come across as gruff and many lack expertise outside their chosen profession. Bonus Proficiencies. For each minor drawback assigned to a sibeccai, you select one of the following: Athletics, Intimidation, Perception, Stealth, Streetwise, or any weapon group (Simple + Martial) or one relevant language. Dullard (Minor) OR Weak (Minor). Many tabaxi lack the mental agility of other races and they are slight of build. Curious (Minor). This is the defining trait of the tabaxi. Obsession(Minor). This obsession can change regularly for a tabaxi. Bonus Proficiencies. For each minor drawback assigned to a tabaxi, you select one of the following: Arcana, Acrobatics, Performance, Sleight of Hand, Survival, Natural Weapons (Simple) or one musical instrument (or one instrument group if using our proficiency groups house rules) or one relevant language. Further Lore & Roleplaying Ideas. Tengu are a crow-like race common to Oriental settings. There are several takes on tengu; several consider them fickle, covetous and even scavengers. These are better represented by using the kenku race. 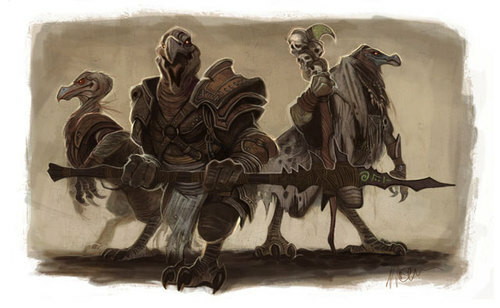 The kenku were likely a group of tengu that lost their wings and became their own race. The tengu below are the mysterious, reclusive race that devote themselves to their studies, be it sword mastery, philosophy or magic. They do consider themselves superior to most beings, but once outsiders prove themselves worthy, tengu can become loyal and trusted allies (and often teachers). Flight. Your wings are fully functional and you have a flying speed of 40 feet. You cannot fly whilst wearing medium or heavy armor or carrying a heavy load. Mimicry. You can mimic any sound you have heard, including voices. A creature that hears the sounds can tell if they are imitations by opposing your Charisma (Deception) check with a Wisdom (Insight) check. You gain proficiency in the Deception skill, and when you are able to use sounds, you add twice your proficiency bonus to any Charisma (Deception) check that you make. Although tengu have this ability, they rarely try to deceive honourable creatures. This cannot be combined with other features, such as Expertise, to increase the bonus further. Natural Weapons. Tengu have sharp beaks and legs end in sharp talons. These can be used as natural weapons, dealing 1d4 slashing damage. (You are not proficient in the use of these weapons unless you take the Natural Weapons group proficiency. It is rare for an honorable tengu to use their natural weapons). Wings. For a birdfolk's wings to be able to function, they must have a number of feet equal to their height free on both sides of them. If their wings can be used a birdfolk gains advantage on Strength (Athletics) checks made to jump, can ignore falling damage, or glide forward 2 feet for every 1 foot descended. You have disadvantage on Strength (Athletic) checks made to swim. Frail (Minor). Tengu are slight of build. Haughty (Minor). Tengu initially come across as very proud and remain so until others prove themselves as equals in honor. Honor-Bound (Minor). Although tengu have the means to deceive, they are not very good with deceptive actions other than their mimicry. The penalty to Charisma (Deception) checks does not apply when they are using mimicry. Outsider (Minor). Tengu live isolated lives and others tend to be wary around them. Bonus Proficiencies. For each minor drawback assigned to a tengu, you select any one of the following: Insight, Intimidation, Perception, Persuasion, Long Blades (Simple), Short Blades (Simple) or calligraphy supplies or one relevant language. Further Lore & Roleplaying Ideas. Therans are tougher, leopard-like catfolk. They known as loners with exceptional survival instincts Therans also suit anthropomorphic versions of pumas and jaguars. They were created for our Kage setting where they are one of the guardian races. Ability Score Increase. Your Dexterity score increases by 1 and your Constitution score increases by 1. Languages. Common and one other language common to the races that share your homeland. (On Kage this extra language is Felisian). Natural Weapons: Theran arms end in retractable claws and they have sharp teeth, both of which can be used as natural weapons, dealing 1d4 slashing damage. Therans are proficient in the use of their claws and bite (and gain the Natural Weapons group proficiency if using our house rules). Anti-Social (Minor) OR Dullard (Minor). Therans are loners first and foremost and often do not have exposure to civilised learning. Aversion (Minor). Applies to canine beasts and when interacting with canisarans, gnolls and other intelligent canine-folk. This drawback is common to therans of Kage where they are guardian races. Primitive (Minor). Therans are nomads and rarely stay in one place long enough to mine and set up forges. Illiterate (Minor). Therans do not typically have a written tradition. Bonus Proficiencies. For each minor drawback assigned to a theran, you select one of the following: Acrobatics, Athletics, Endurance, Intimidation, Nature, Stealth, or Survival or one relevant language. Ability Score Increase. This now depends upon subrace (see below). 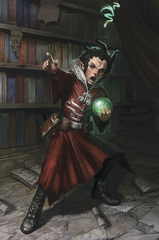 The ability scores presented in the Player's Handbook represent tieflings connected to Asmodeus only. Infernal Legacy. This now depends upon subrace (see below). 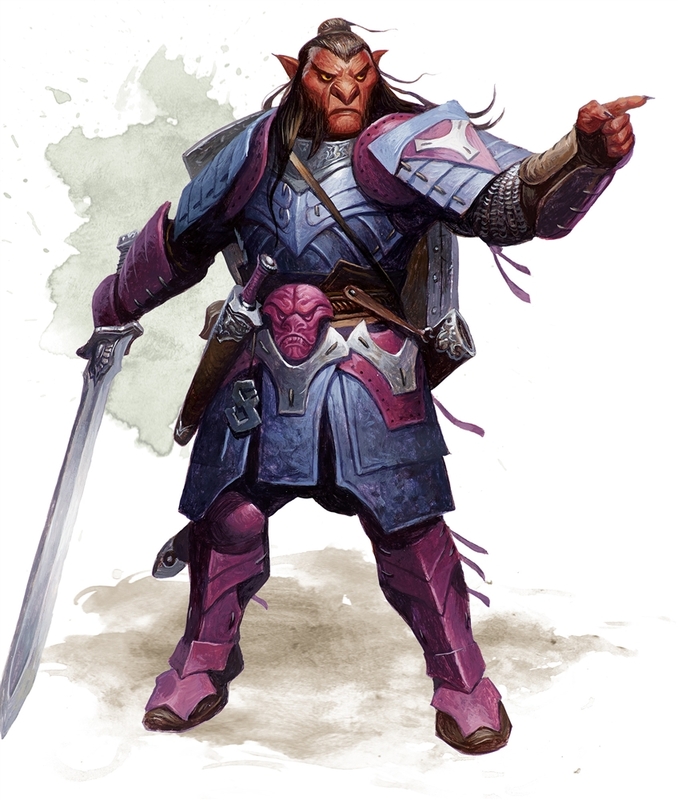 The legacy presented in the Player's Handbook represent tieflings connected to Asmodeus only. A tiefling subrace is determined by which devil is connected to its family. Self-Reliant (Minor). Tieflings have learned to not rely upon others. Outsider (Minor). Tieflings are typically not trusted wherever they are and as a result have found it hard to trust others. Bonus Proficiencies. For each minor drawback assigned to an Asmodeus tiefling, you select any one of the following: Arcana, Intimidation, Persuasion, Brawling (Simple + Martial), Short Blades (Simple + Martial) or one relevant language. Game Statistics & Lore. 5e D&D Mordenkainen's Tome of Foes chapter 1. Bonus Proficiencies. For each minor drawback assigned to an Baalzebul tiefling, you select any one of the following: Arcana, Deception, Intimidation, or Brawling (Simple + Martial) or one relevant language. Cautious. Like Dis himself, these tieflings concern themselves with self-preservation. Bonus Proficiencies. For each minor drawback assigned to a Dispater tiefling, you select any one of the following: Arcana, Deception, History, Investigation, Persuasion, Stealth, or Hammers & Maces (Simple + Martial) or one relevant language. Bonus Proficiencies. For each minor drawback assigned to an Fierna tiefling, you select any one of the following: Arcana, Deception, Intimidation, or Persuasion or one relevant language. Bonus Proficiencies. For each minor drawback assigned to a Glasya tiefling, you select any one of the following: Arcana, Deception, Stealth, Whips, Nets & Chains (Simple) or Short Blades (Simple + Martial) or one relevant language. Bonus Proficiencies. For each minor drawback assigned to an Levistus tiefling, you select any one of the following: Arcana, Intimidation, Survival, Brawling (Simple + Martial), Short Blades (Simple + Martial) or one relevant language. Obsession (Minor). These tieflings have inherited Mammon's greed. When treasures lie before them, they find it hard to focus anything but that wealth. Bonus Proficiencies. For each minor drawback assigned to an Mammon tiefling, you select any one of the following: Arcana, Deception, Persuasion, Brawling (Simple + Martial), Short Blades (Simple + Martial) or Thieves' Tools or one relevant language. Cocky (Minor). These tieflings have inherited some of Mesphistopheles' arrogance and extreme self-confidence. Bonus Proficiencies. For each minor drawback assigned to an Mephistopheles tiefling, you select any one of the following: Arcana, Intimidation, Brawling (Simple + Martial), Polearms (Simple + Martial) or one relevant language. Violent (Minor). These tieflings have inherited Zariel's warlike and aggressive demeanor. Bonus Proficiencies. For each minor drawback assigned to an Zariel tiefling, you select any one of the following: Intimidation, Brawling (Simple + Martial), Long Blades (Simple), Short Blades (Simple + Martial) or Spears (Simple) or one relevant language. Further Lore & Roleplaying Ideas. 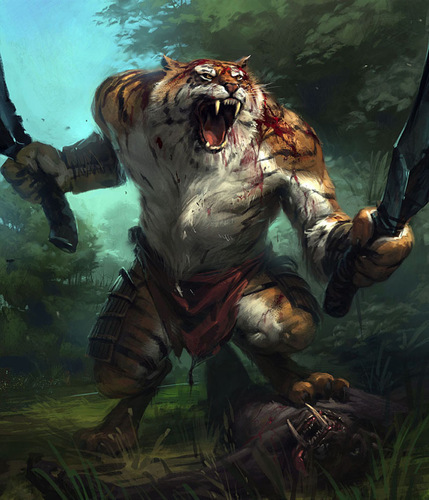 The stronger, tiger-like tigrans were developed for Kage and represent a real savage, hunter-styled catfolk. Natural Weapons: Tigran arms end in retractable claws and they have sharp teeth, both of which can be used as natural weapons, dealing 1d6 slashing damage. 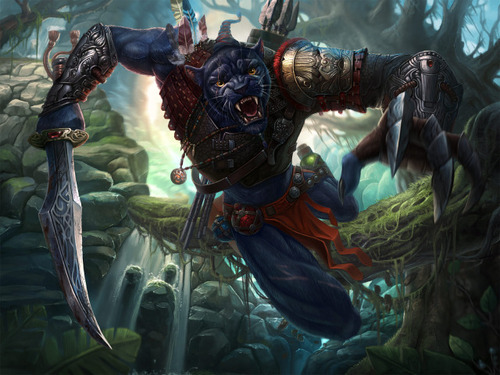 Tigrans are proficient in the use of their claws and bite (and gain the Natural Weapons group proficiency if using our house rules). Anti-Social (Minor). Tigrans have trouble getting along with each other, let alone others. Aversion (Minor). Applies to canine beasts and when interacting with canisarans, gnolls and other intelligent canine-folk. May not apply to many settings - this was in place for our Kage guardian races. Dullard (Minor) OR Insensitive (Minor). Tigrans rely on might to rule, not intelligence, and they care little for others. Mean (Minor). Tigrans have a savage streak. Bonus Proficiencies. For each minor drawback assigned to a tigran, you select one of the following: Acrobatics, Athletics, Intimidation, Stealth, Survival, or Brawling Weapons (Simple) or one relevant language. Haughty (Minor). Isolation and a sense of seeing themselves as the caretakers of the see means tritons can come across as arrogant and haughty. Loyal (Minor). Tritons are compelled to protect others from the evils of the deeps and are willing to die for this cause. Outsider (Minor). Tritons find it very hard to understand other cultures and most other cultures are completely unaware of the tritons' contributions to the safety of the seas. Bonus Proficiencies. For each minor drawback assigned to a triton, you select one of the following: Arcana, Endurance, Intimidation, Persuasion, Spears (Simple + Martial) or one relevant language. Further Lore & Roleplaying Ideas. The ursus are a race of sentient, humanoid, bear-like creatures with immense strength and surprising wisdom. They are generally solitary creatures and wander the wilds alone, but they have a loose, tribal society governed by a king or queen. This solitary nature gives them plenty of time to think and reflect on themselves and their place in the world. 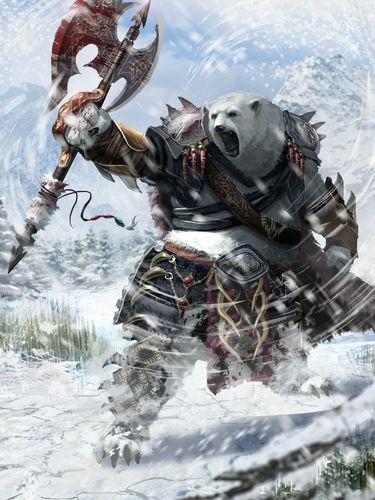 Most other races consider ursus to be vile-tempered and to give them a wide berth. For all the perception of their anti-social tendencies, ursus are not particularly aggressive. Most are loners and just want to be left alone to do as they please. They rarely attack anyone without reason, though they consider being pestered or insulted cause enough. They are very blunt creatures and say what’s on their mind with no regard for the feeling’s of others, politics or alliances. This is what makes other races think of them as being rude, abrupt and insulting. Most have no interest in power, fame or fortune and consider the functionality of items over the aesthetics of them. Due to their size and strength, ursus are ideally suited to being smiths and it has become a tradition that is passed along family lines. This means that they are often skilled as armorers, blacksmiths or weapon smiths. They are also naturally gifted as warriors and instinctively understand tactics and warfare. Ursus loathe Bugbears. Ursus can be found in most climates but tend to prefer cooler locales. They typically wander the wilds and live off the land as a hunter/trapper, though some become mercenaries or take up the life as an adventurer. Others establish small homesteads far from other races where they can tend a small garden and look after some livestock. The typical ursus stands between 6-7½ feet. They generally have a hunched stance and can stand up to 9 feet when standing straight. Ursus weigh between 500-740 pounds. Their fur is black, dark to light brown or white. Especially old ursus may show signs of greying around their ears and muzzles. Ability Score Increase. You Strength increases by 2 and Wisdom by 1. Insulated. You are naturally adapted to cold climes, as described in chapter 5 of the Dungeon Master's Guide. Natural Weapons. Ursus fingers end in thick hard claws and they have long sharp teeth, both of which can be used as weapons and deal 1d6 slashing damage. Languages. Common (& Guardinal on Kage). Keen Smell. Ursus have advantage on Wisdom (Perception) checks that rely on smell. Burst of Speed. You can perform the Dash as a bonus action. You must finish a short or long rest before you can use this feature again. Speed. Base speed is 25 feet. Ursus lumber in their movements and tend to lack a sense of urgency (until angered), so they are generally slower than other races their size. Anti-social (Minor). OR Outsider (minor): Ursus prefer their solitude and struggle to get along with others and the solitary nature of Ursus often seems strange to those not used to living alone in the wild. Short Sighted (Minor). Though they can see in the dark, the eyesight of Ursus in general is poor. All-Thumbs (Minor). Ursus claws are non-retractable and effect their fine motor skills. Bonus Proficiencies. For each minor drawback assigned to an ursus character, you select one of the following: Athletics, Insight, Intimidation, Nature, Survival, Hammers & Maces (Simple + Martial), Natural Weapons, Spears (Simple + Martial) or smith's tools or one relevant language. Further Lore & Roleplaying Ideas. 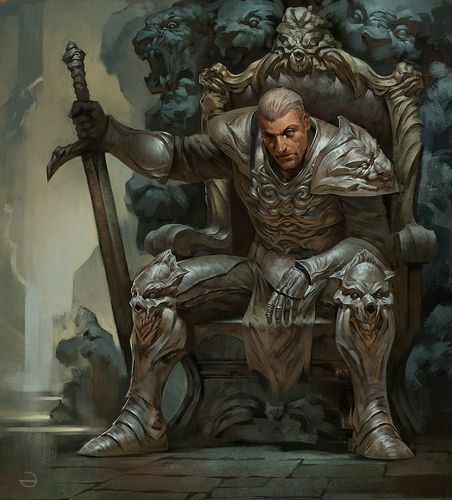 Verrik are red-skinned, highly intelligent human-like beings from the Diamond Throne setting. Ability Score Increase. Your Wisdom score increases by 2 and your Intelligence score increases by 1. Sensory Control. As a bonus action or a reaction a verrik can shut down any number of their senses. This means applying the deafened and/or blinded condition. Loss of smell could provide bonuses against scent-induced sickness and shutting off touch provides reduces all damage by 2 for the round, but the verrik has disadvantage on all Strength, Dexterity and Constitution checks, including attack rolls made with these abilities. Verrik can also ignore the effects of extreme heat and cold, as described in chapter 5 of the Dungeon Master's Guide. Telepathy: Verrik can communicate telepathically with any creature within 30 feet (Near range for our house rules) that has a language. Verrik Psionics. You know the mage hand cantrip and the hand is invisible when you cast the cantrip with this trait. When you reach 3rd level, you can cast the command spell once with this trait, and you regain the ability to do so when you finish a long rest. When you reach 5th level, you can cast the detect thoughts spell once with this trait, and you regain the ability to do so when you finish a long rest. Wisdom is your spellcasting ability for these spells. When you cast them with this trait, they don't require components and you can use your Telepathy trait rather than verbalising them. Outsider (Minor). Despite appearing mostly human, verrik neither think nor feel like humans and often have difficulty relating to other races. Anti-Social (Minor) OR Weak (Minor). Verrik can come across as aloof or self-centered and very few of them have large builds. Bonus Proficiencies. For every minor drawback assigned to a verrik character, choose one of the following: Acrobatics, Arcana, Intimidation, Investigation or calligrapher's supplies or one relevant language. Further Lore & Roleplaying Ideas. 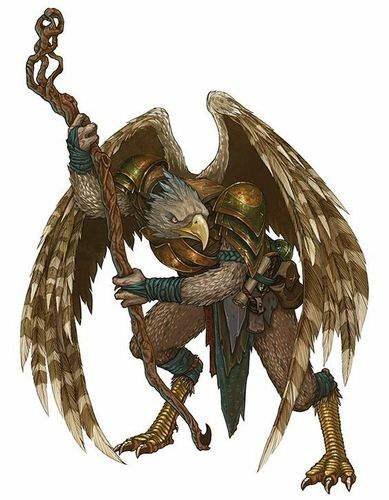 There have been several takes on vulturefolk from vulchlings and the magical nagpas, both from early editions of D&D. (The tengu subrace would be a better representation of the nagpas). Dire corbies have also been used to represent vulturefolk with no wings. They are a strong, aggressive, underground dwelling race. The entry below is based more upon this latter subrace. Vulkrar have a greater scent sense than other birdfolk and are capable of eating rotten meat. Ability Score Increase. Your Constitution score increases by 2 and your Wisdom score increases by 1. Carrion Resilience. You have advantage on saving throws against poison, and you have resistance against poison damage. Darkvision. You can see in dim light within 60 feet of you as if it were bright light, and in darkness as if it were dim light. You can't discern colour in darkness, only shades of grey. Many flocks of vulkrar have adapted to a life fully lived underground. Natural Weapons. Vulkrar have sharp beaks and legs that end in sharp talons. These can be used as natural weapons, dealing 1d6 slashing damage. All vulkrar are proficient with their natural weapons (or with the Natural Weapons group proficiency if using our house rules). They actually enjoy pecking at their enemies. Anti-Social (Minor). Vulkrar have enough difficulty relating to each other, let alone others. Belligerent (Minor). Vulkrar are aggressive in all interactions. Dullard (Minor). Vulkrar are not known for their intellectual processing. They learn by experiencing. Primitive (Minor). Vulkrar do not craft and rarely even use weapons. They are scavengers. Bonus Proficiencies. 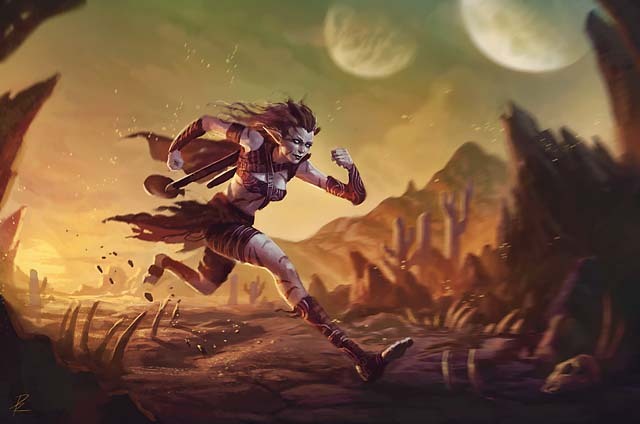 For each minor drawback assigned to a vulkrar, you select one of the following: Athletics, Endurance, Intimidation, Perception, Stealth or Survival or one relevant language. Further Lore & Roleplaying Ideas. 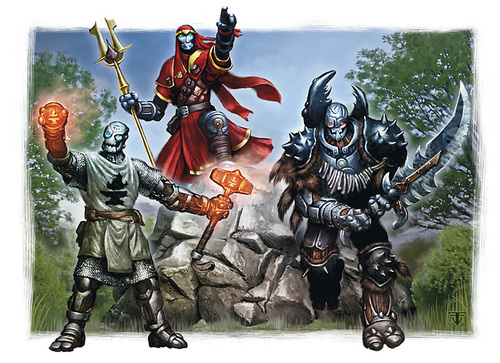 Warforged are constructs that have long been associated with the Dungeons & Dragons setting of Eberron. The 3rd edition description could be used, just as easily as the 4th Edition version from the Eberron Player's Guide. In 13th Age they are crafted by dwarves and known as forgeborn or dwarf-forged. On Kage, they are mostly associated with the lands of Shan. 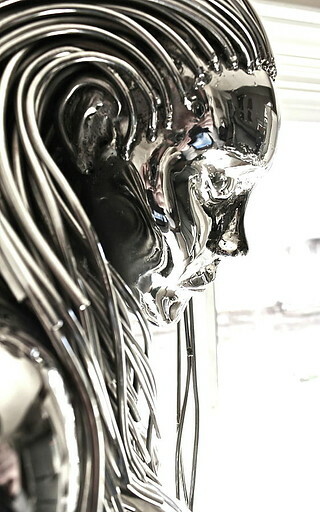 Warforged are created for a purpose and are built to serve that purpose. You can choose either of the 'subraces' below. Due to the variable nature of envoy warforged, there are no common drawbacks. Clumsy (Minor) OR Insensitive (Minor). Being a construct, you may have difficulty relating and being perceptive to other living creatures, or your formidable and rigid bulk may hinder movement. Socially Inept (Minor). Warforged do not have expressions and are generally hard for others to relate to. Bonus Proficiencies. For each minor drawback assigned to a skirmisher warforged, you select one of the following: Athletics, Endurance, Intimidation, Perception, any weapon group (Simple + Martial weapons), any vehicle group, carpenter's tools or smith's tools or one relevant language. Insensitive (Minor) OR Weak (Minor). Being a construct, you may have difficulty relating and being perceptive to other living creatures, or your smaller build may hinder power. Bonus Proficiencies. For each minor drawback assigned to a skirmisher warforged, you select one of the following: Acrobatics, Athletics, Endurance, Nature, Perception, Stealth, Survival, any weapon group (Simple, but you also add Martial weapons if any of the following groups are chosen: Crossbows, Pistols or Short Blades), any vehicle group, carpenter's tools or smith's tools or one relevant language. Arrogant (Minor). 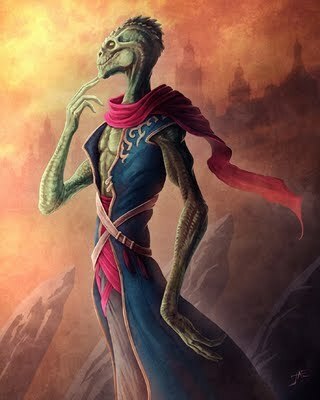 Yuan-ti are an emotionless race, yet feel completely superior to other humanoids, in the same way that a human can feel superior to a chicken. Outsider (Minor). Yuan-ti have a lot of trouble relating to other humanoids and most societies would be quite distrustful to snake-folk. Bonus Proficiencies. 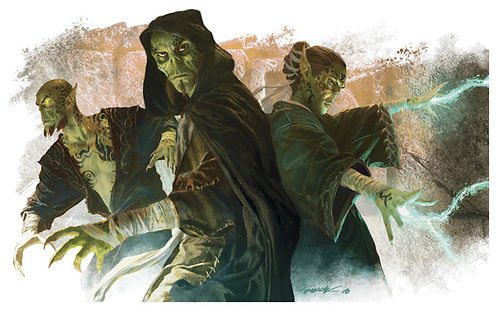 For each minor drawback assigned to a yuan-ti, you select one of the following: Arcana, Deception, Intimidation, Perception, or Stealth or one relevant language.